Laiya, life in color. That is how the Landco panels describe Laiya. And one who has never been there will find comfort in these signs nailed on several “postes” all the way from the SLEX exit, through to San Pablo, Laguna , through to Tiaong, Quezon, and all the way to Laiya in San Juan, Batangas. 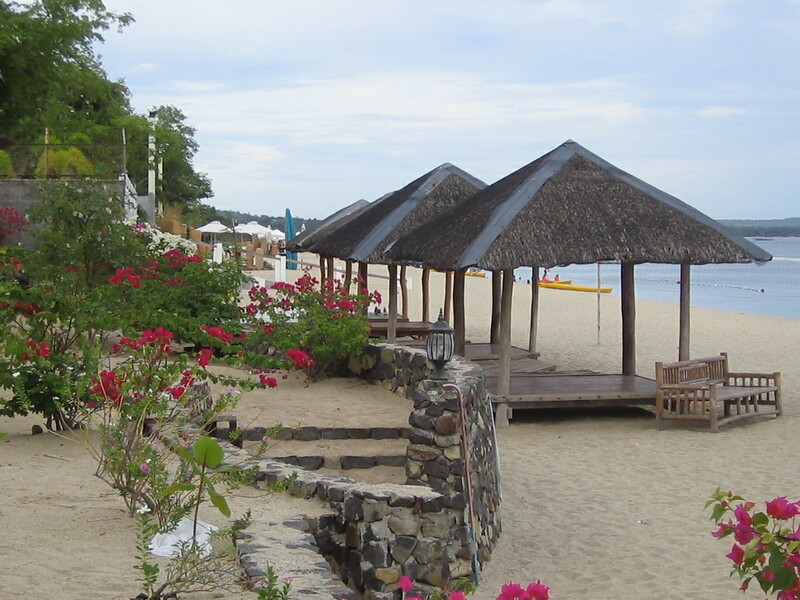 Another developer calls Laiya the best kept secret of Batangas. Well, not anymore. 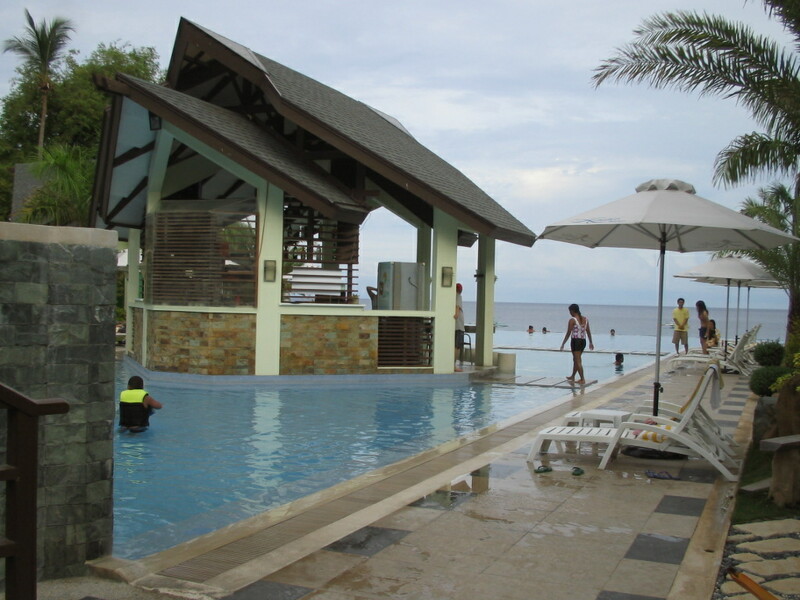 Laiya attracts tourists, mostly locals – – – families, yuppies, solo travelers mainly because of word of mouth. The white sands of Laiya mesmerize the visitors, pleasantly surprised that such a spot existed along Tayabas Bay, only 2 1/2 hours away from Manila. There are probably 50+ resorts in Laiya, about 25 kms away from the highway in San Juan where the Town Hall sits in the corner. There, signages of the different resorts compete for attention. From mom & pop operations to high-end 5-star accommodations. 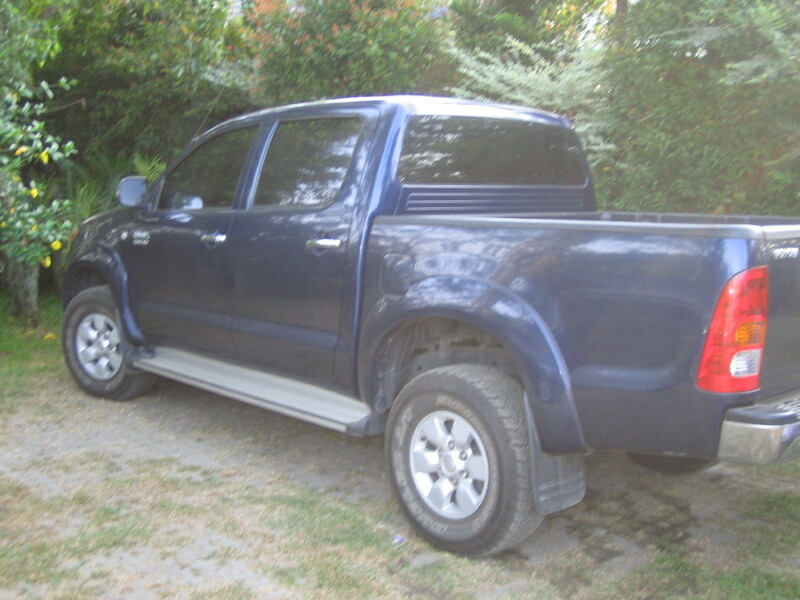 The 25 km drive is pleasant, with the road lined with mahogany on one side, and a view of the mountains on the other. 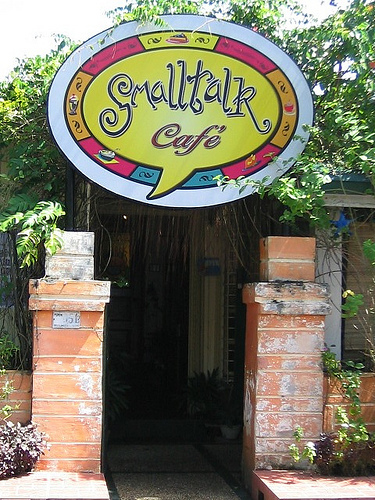 However, more travelers prefer to experience Laiya almost like the way the locals do. 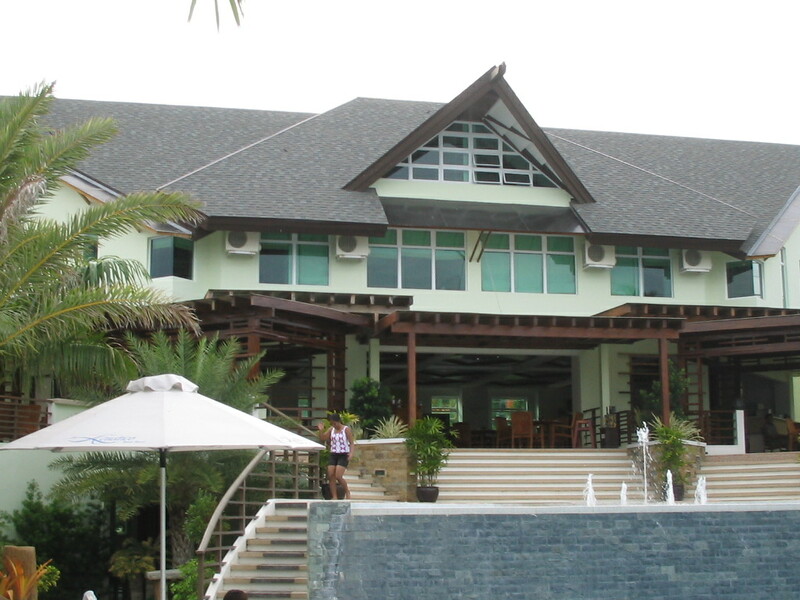 I checked one cluster, and found out that at Moonlight Resort, the rooms cost P3,000 per day, negotiable. But they charge higher for the same room when there are more people within your party. 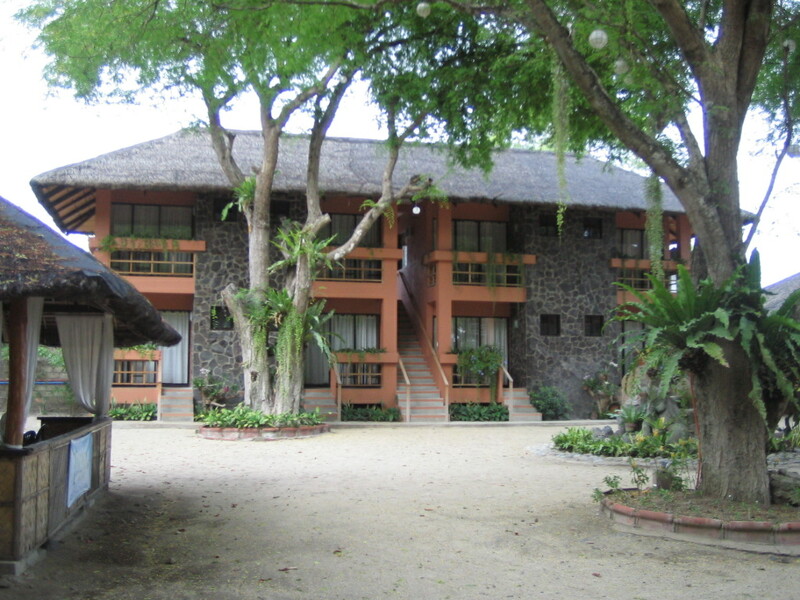 The trick is to go from one resort to another and bargain until you get the best price. After all, they are all within the same mass of land facing the same body of heavenly water. 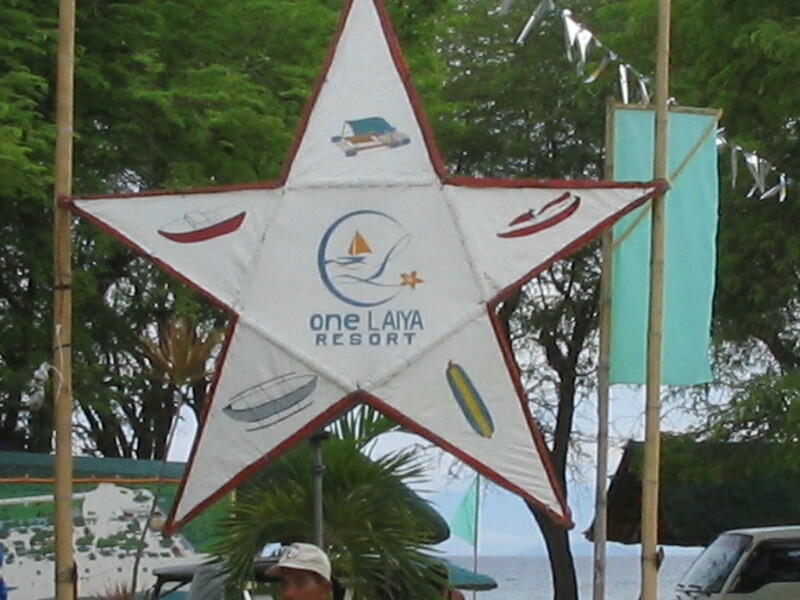 I went to One Laiya, formerly called Tayabas Bay beach resort. 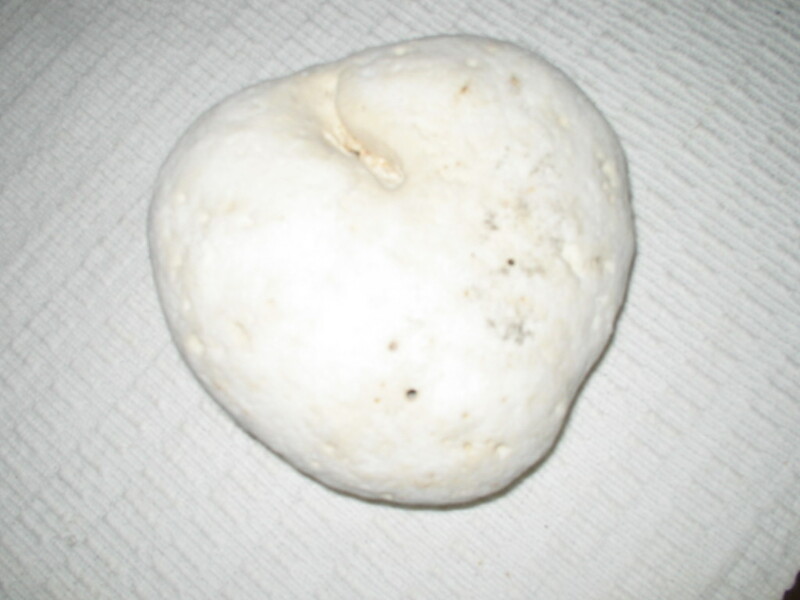 It is adjacent to the Porto Laiya. It is easily one of the most popular destinations. Picnic sheds for rent dot the shore. 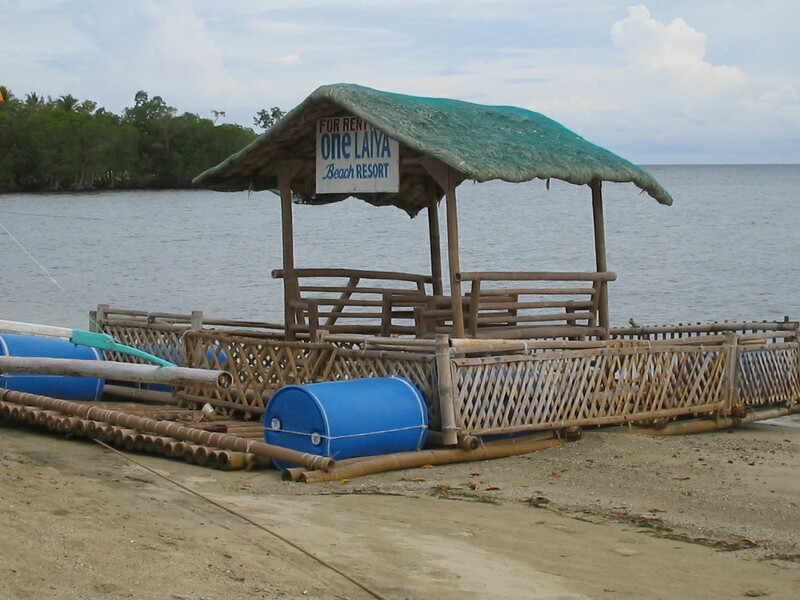 A small raft with a shed and table can be rented for one whole day’s outing on the water for P3,000. 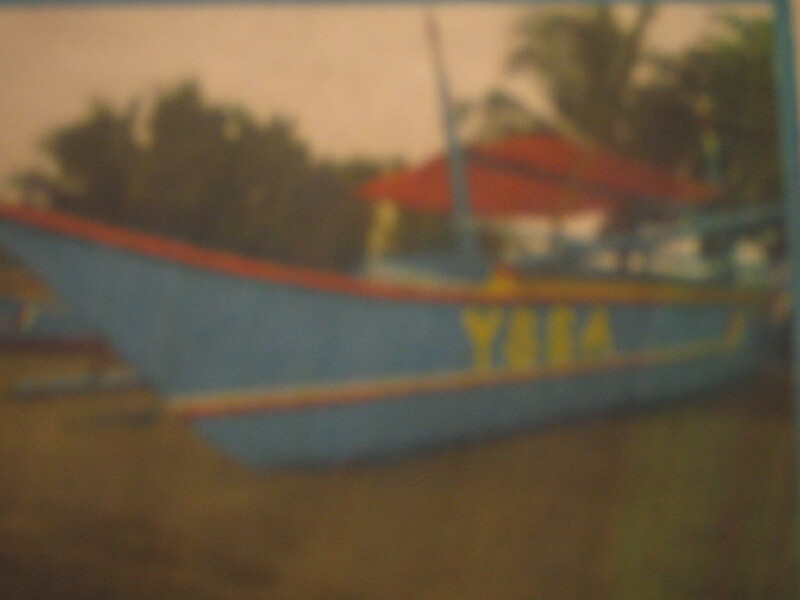 A boat for 10 people can be rented to take you to the Coral Reef for snorkeling, at a hire rate of P1,000. I actually found these rates to be expensive. The reef is just 10 minutes away. Negotiate! 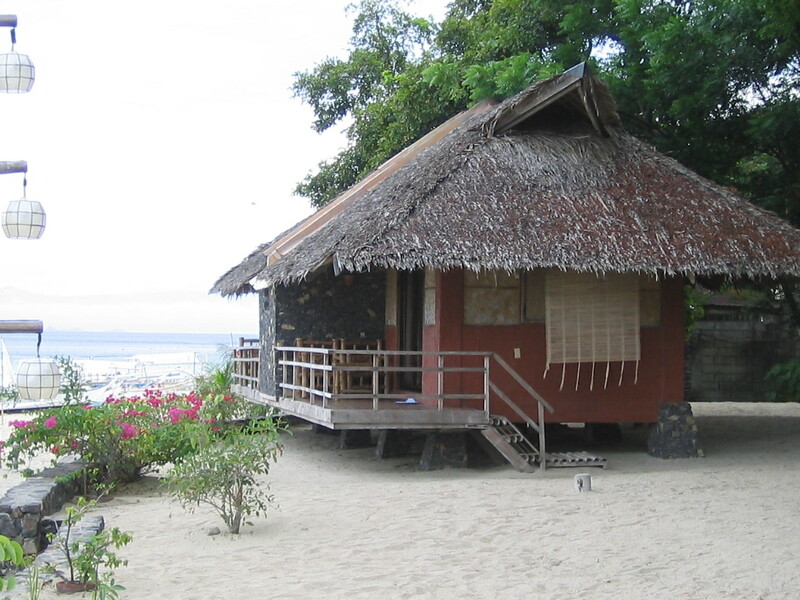 They also rent out nipa huts for overnight accommodations. 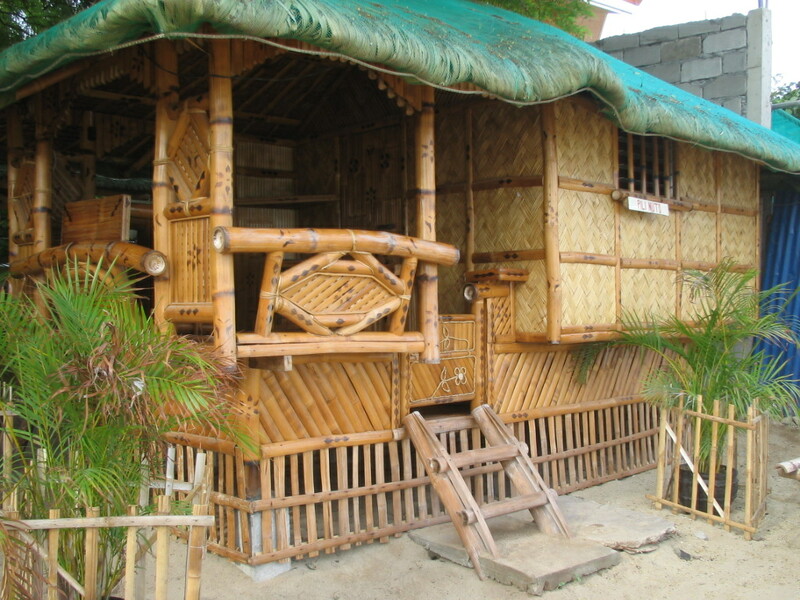 A nipa hut with one bed costs P2,500 per night, and accommodates 2-3 persons. 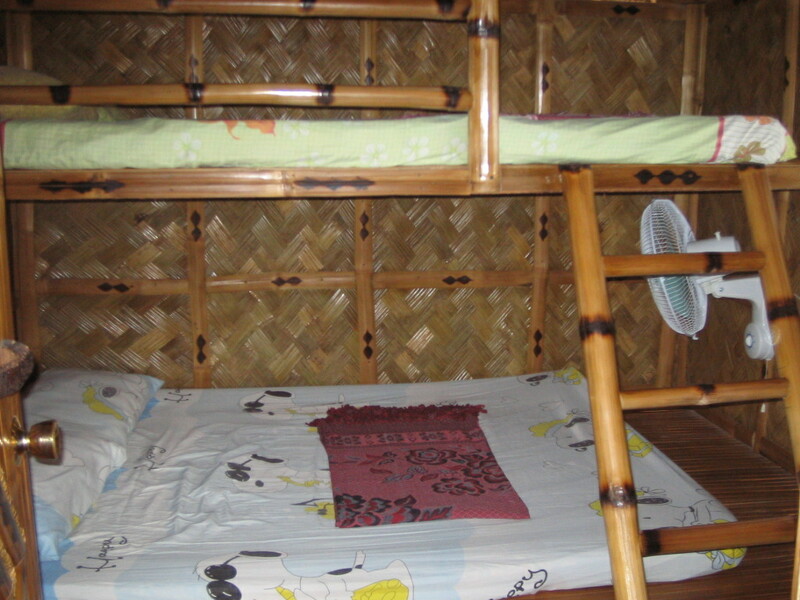 A hut with double deck beds costs P3,000, and can accommodate 6 . These huts do not have private toilets. No aircon, just fans. They also have airconditioned rooms, and a family can get into a VIP room with 2 queen size beds for P5,000 overnight.It doesn’t really look like it is fit for a very important person. Only, the rooms have airconditioning and a toilet. 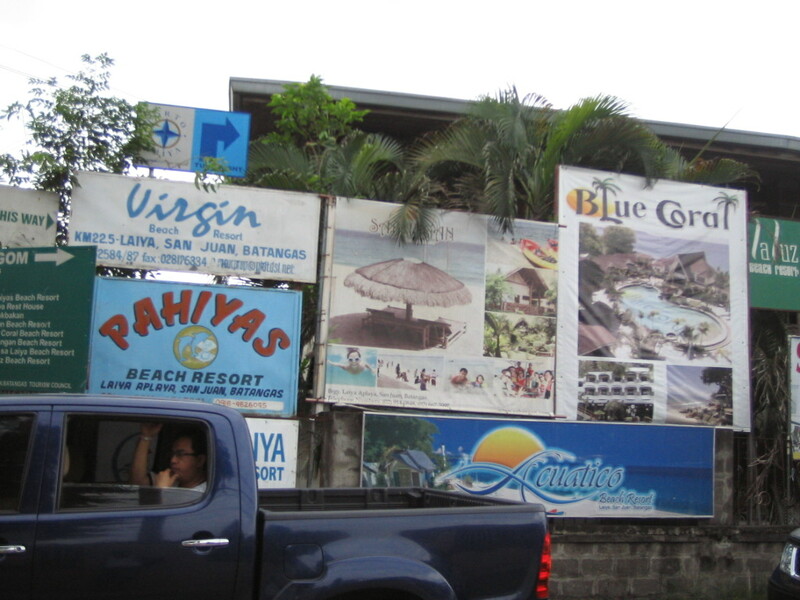 From One Laiya, I went to the far end of the resort area, past the concreted road. There is where 3 of the top resorts are clustered. 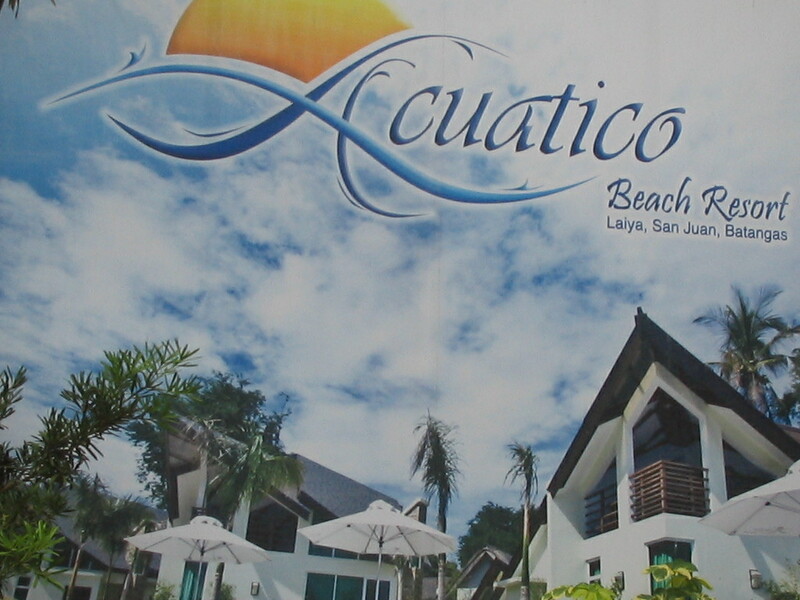 The most expensive accommodations in this beach town is Acuatico. Guests love their well-appointed rooms, more like free-standing villas, around the infinity pool. 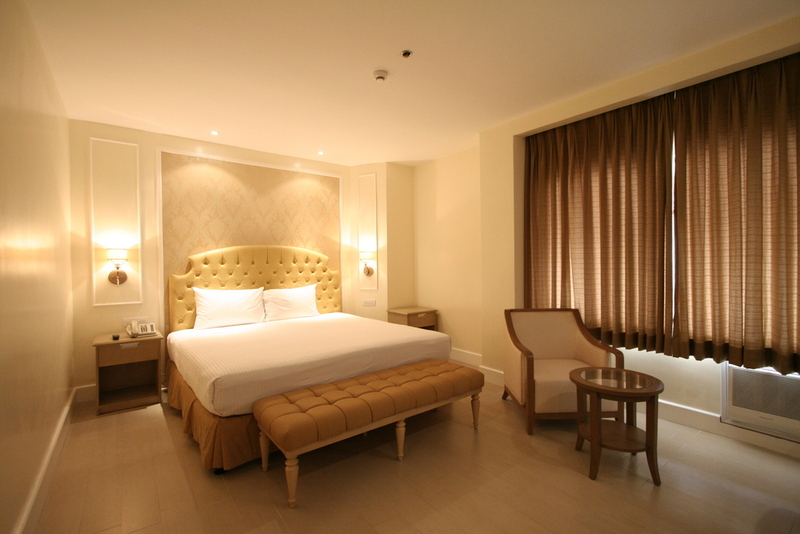 The cheapest room goes for P6,300 per night for 2 persons, plus P1,575 for each extra person in the room. 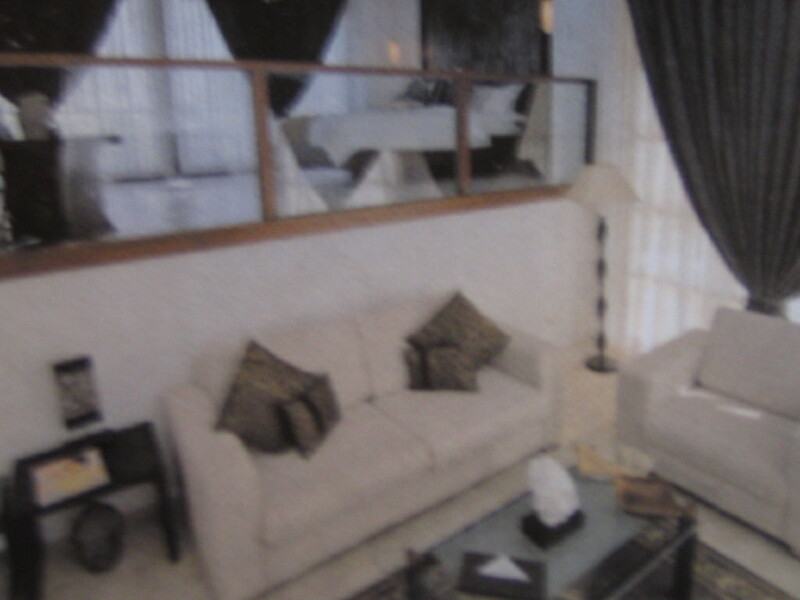 They also have a room called Estancia that accommodates 6 persons, at P21,000 per night. Room rates include breakfast and all-day complimentary coffee or tea, plus use of water sports equipment like pedal boats and kayaks. 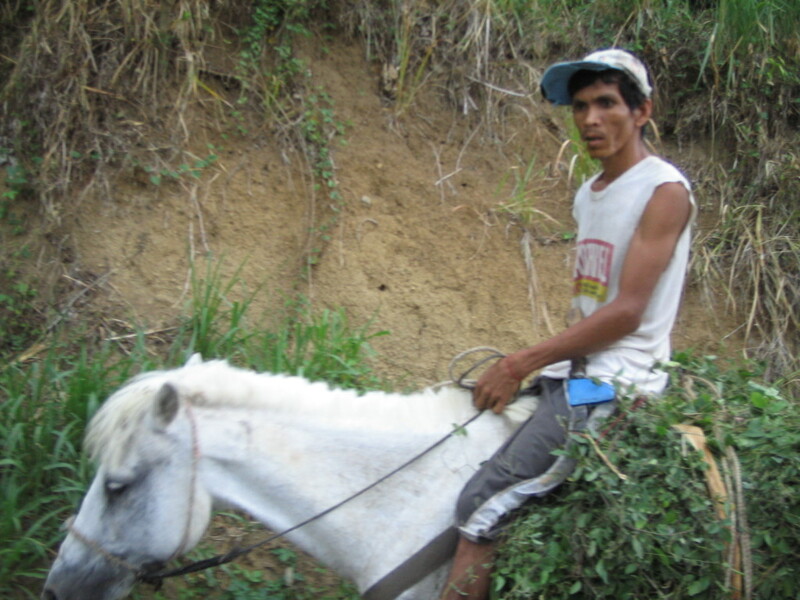 Acuatico is so popular that they do not have off-peak rates, nor group rates. 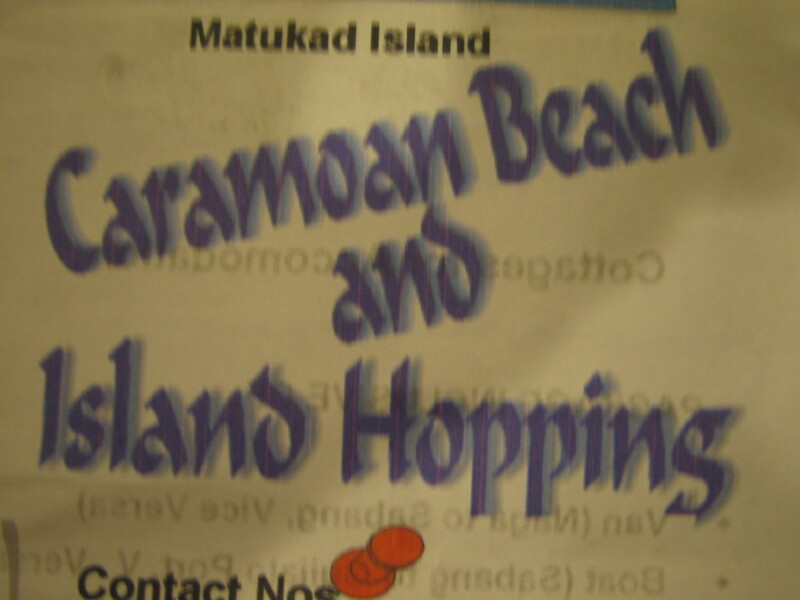 My personal favorite is Balai sa Laiya, just next to Acuatico. 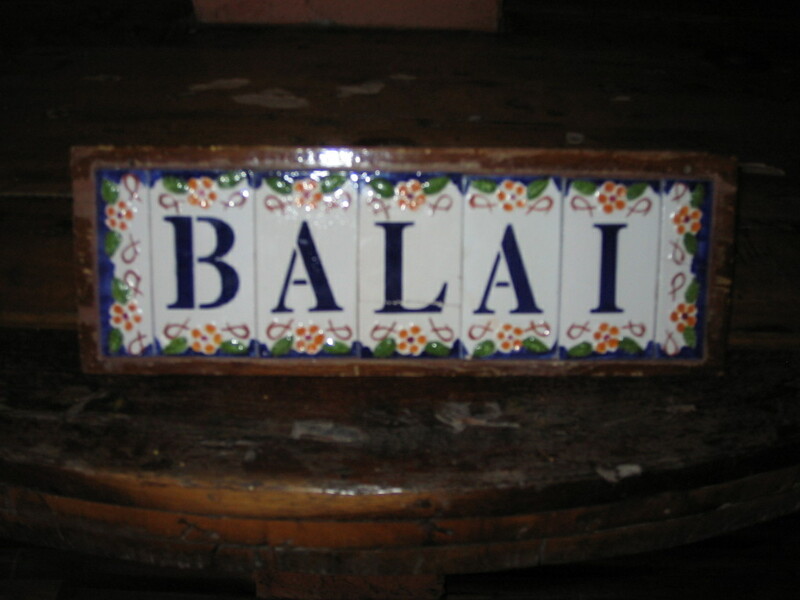 While Acuatico looks high-end and busy, Balai has a restful, provincial setting even while the accommodations are comfortable and air conditioned. 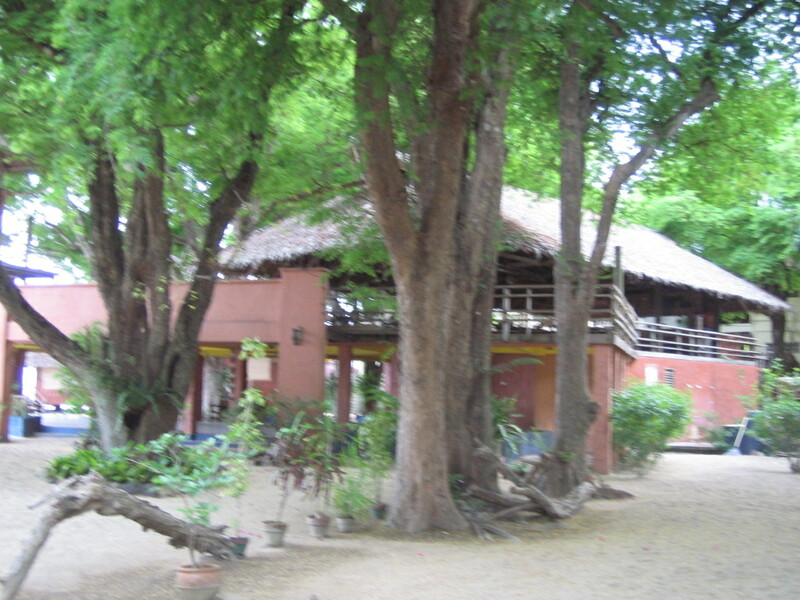 Tall trees provide shade around the property, and over the cottages. 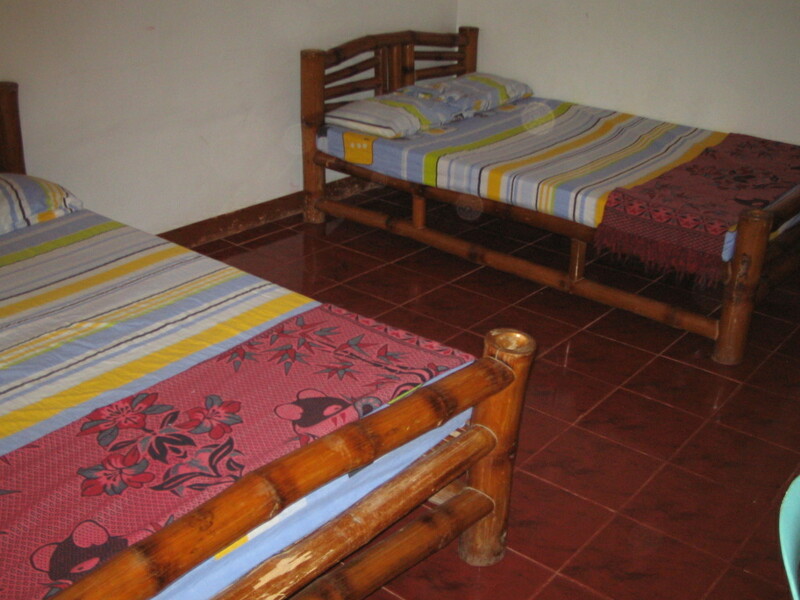 Single occupancy in a seaside room is P2,900, twin or double is P4,300. 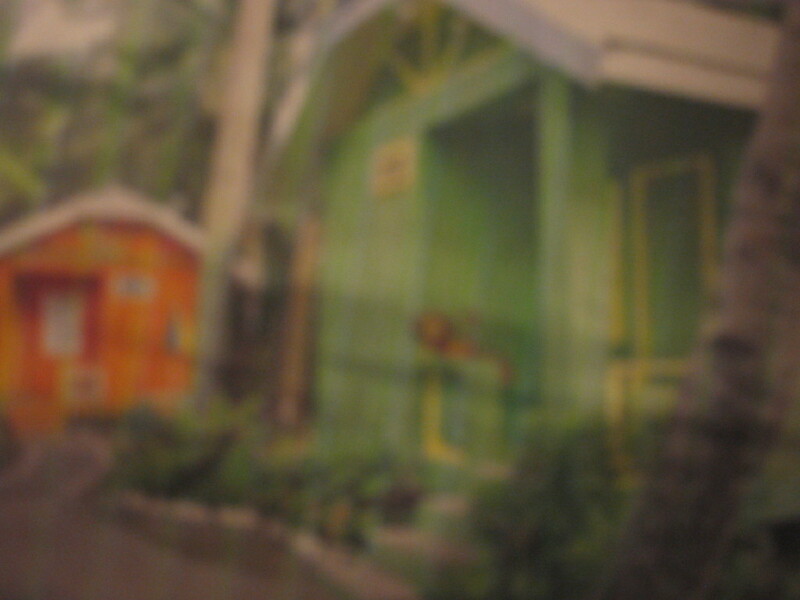 Rooms under the trees are a bit cheaper, by P100 per person. These rates assume aircon is not used, and an aircon charge of P600 per night per room is charged if guests want this convenience. 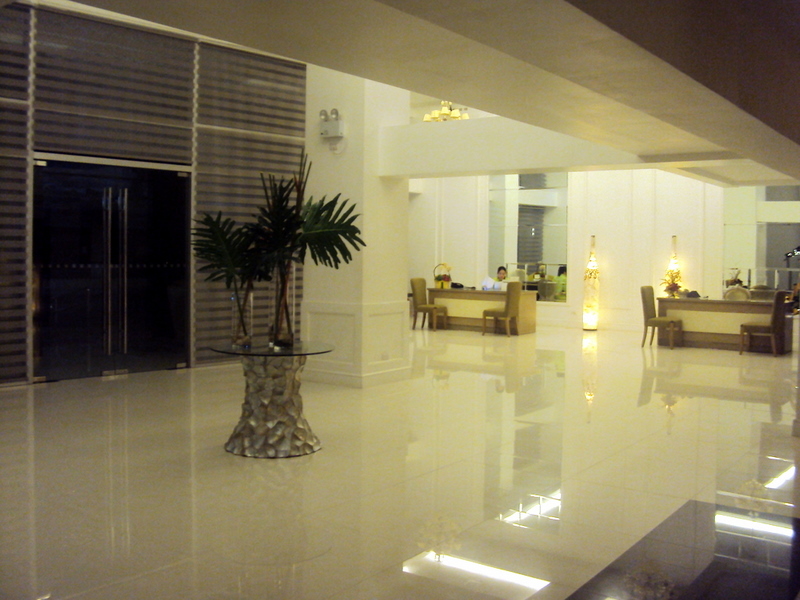 Rates include 4 buffet meals plus free use of facilities like billiards and pool table, and volleyball. UPDATE: Balai sa Laiya has just been bought by its next-door-neighbor Acuatico. 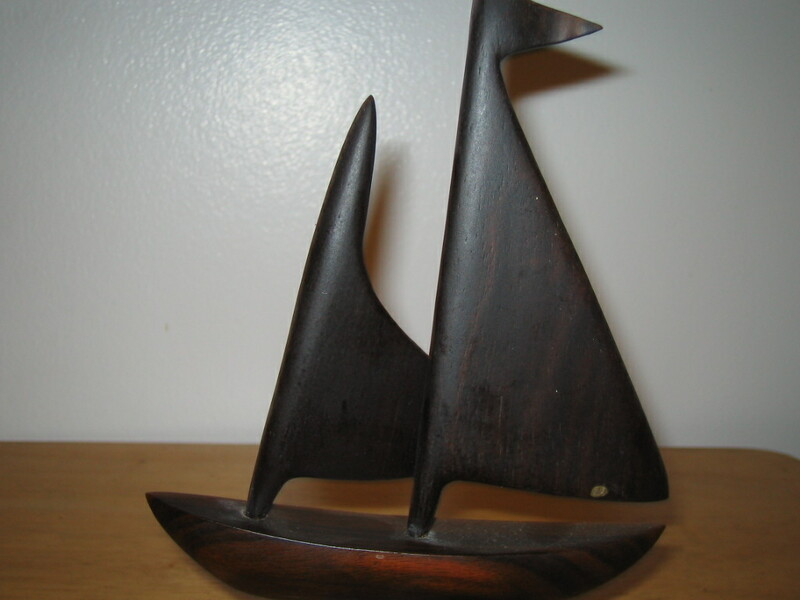 You can also now own a piece of Laiya. 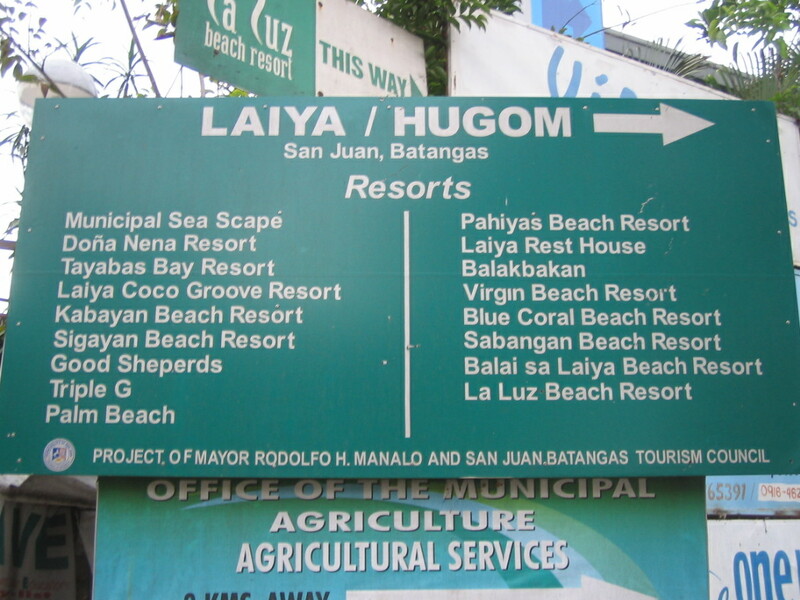 Landco has bought what used to be Laiya Coconut Grove and is developing it, for sale as PLAYA LAIYA, thus, all those signages. 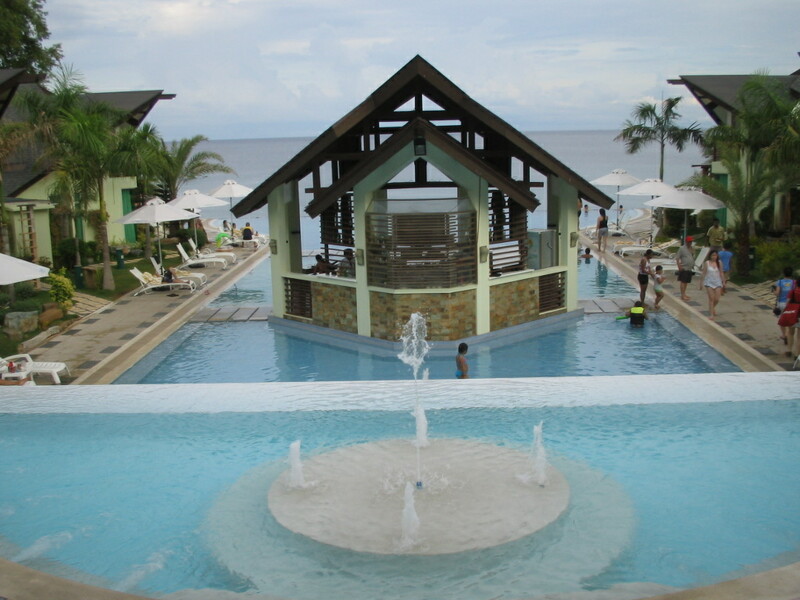 Landco also developed Punta Fuego, Terazzas de Punta Fuego, and Canyon Woods. Expect very high-end pricing. Activ Group, the real estate company that developed the high-end Malarayat Golf community in Batangas is developing Porto Laiya. Lot prices are at an average of P6,000 per square meter. I knew about these as I was having lunch, and the owner of the place( na itatago na lang natin sa pangalang Tita de Castro) offered to sell me property. She thought I was looking for land to buy, not knowing that I always just drive on, aimlessly, without a destination and without any schedule to follow. (And no, she is not related to Gloria de Castro, the lady in Talisay that I mentioned in a previous entry). Although she did mention a piece of land that seemed inexpensive. Hmmmmmm. I just might, one day, live my life in color in Laiya. Question: How do I get to Laiya ? Take the South Luzon Expressway (SLEX) and drive on towards the direction of Sto.Tomas in Batangas. Drive When you hit Sto. Tomas, turn left towards Quezon province, hitting Alaminos, Laguna first. 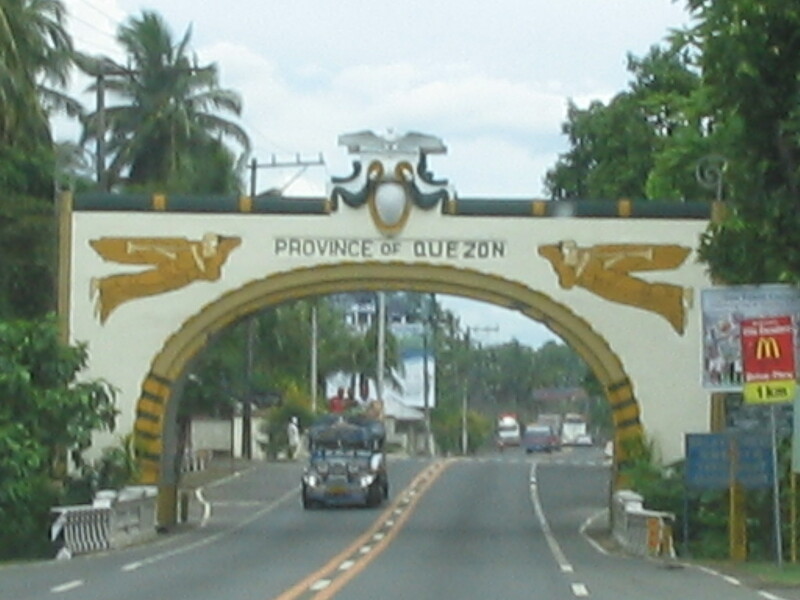 You will pass San Pablo City, and then you will hit the Laguna-Quezon boundary. You will pass by Dolores, and then Tiaong. 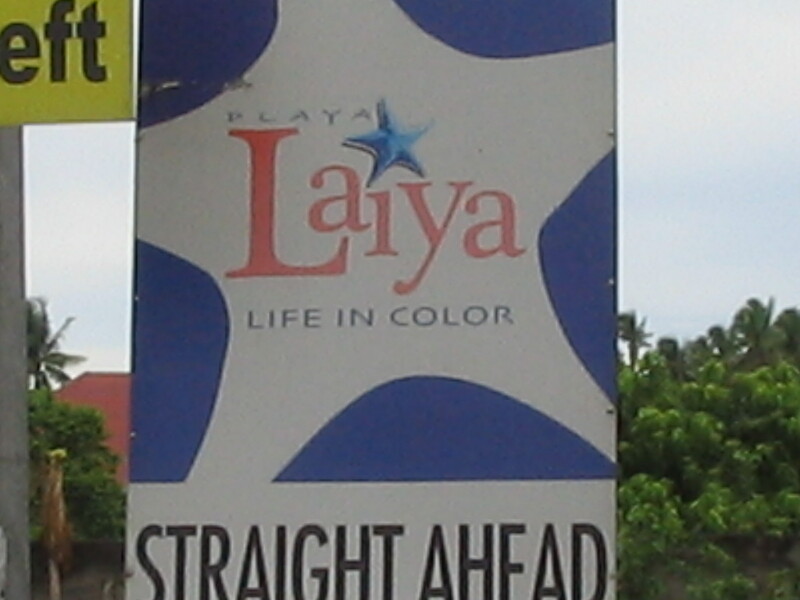 Actually, as early as in San Pablo (Laguna), you will see signages from Landco saying “Laiya, Life in Color”. this is a good directional sign for you. Towards the end of Tiaong, you will make a right turn where there is a TURN RIGHT sign by Landco (Laiya, Life in Color) in that corner that says “San Juan”. 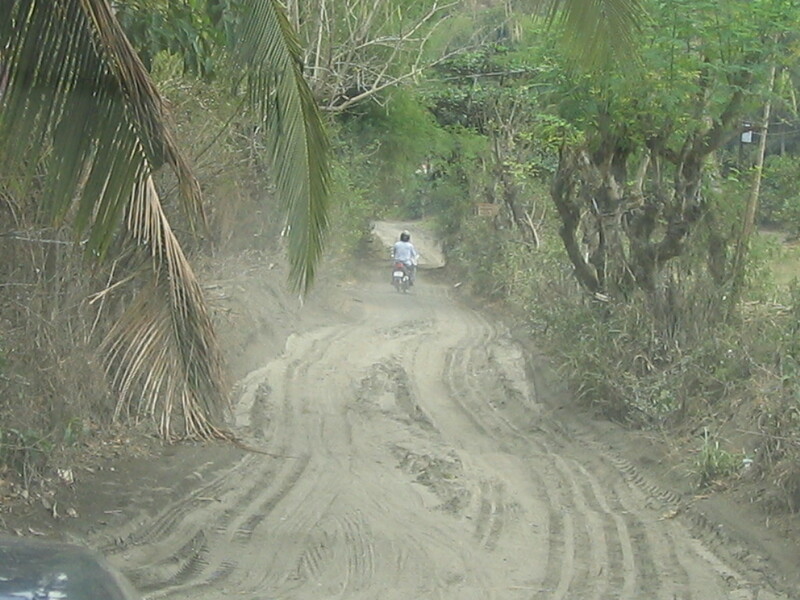 Follow this road until you hit San Juan town proper, about 14 kms away. This road forks at some point, with a little bit of unpaved road towards the end. Take this unpaved road. The unpaved road is so short anyway and you will soon be back to cemented roads. You will then find yourself at an intersection. 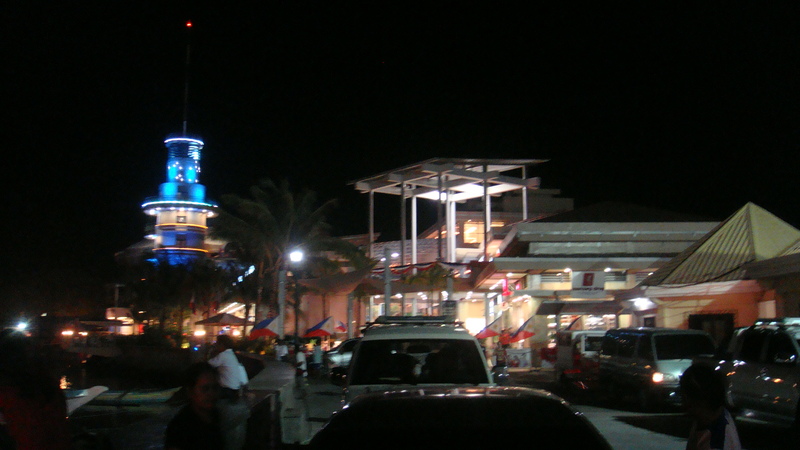 This is the main highway, and you will see the San Juan Town Hall at the corner. Do not make any turns, just cross the road, and you are on your way to the beach area, around 25 kms ahead. 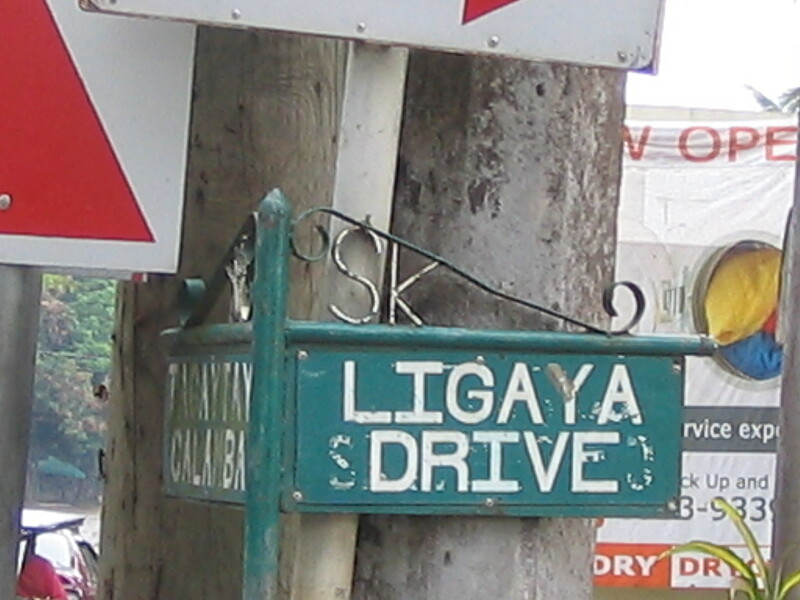 Even as you drive on this road, you will see several signages that refer to beach resorts and subdivisions being developed in Laiya. The trip is approx 2 1/2 hours from the Villamor tollgate of the SLEX. Take the same direction to Sto. 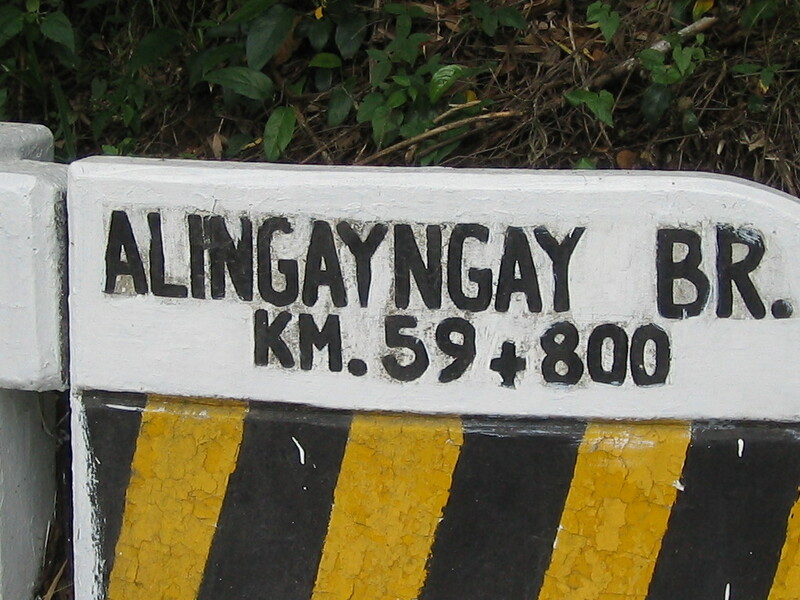 Tomas, Batangas, as in the directions above. 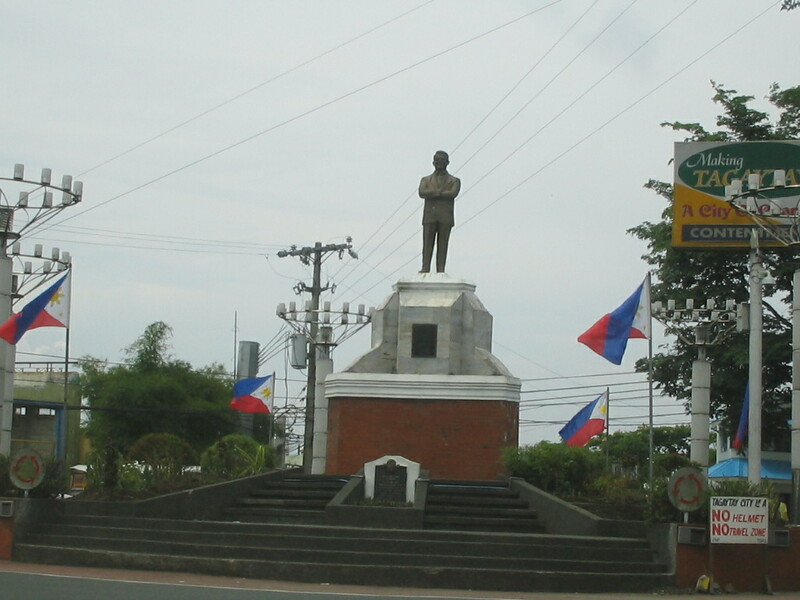 Drive on to Lipa, either via the old road or thru the STAR TOLLWAY, making your exit in Lipa. From Lipa, drive on to Rosario, the next bigger town. 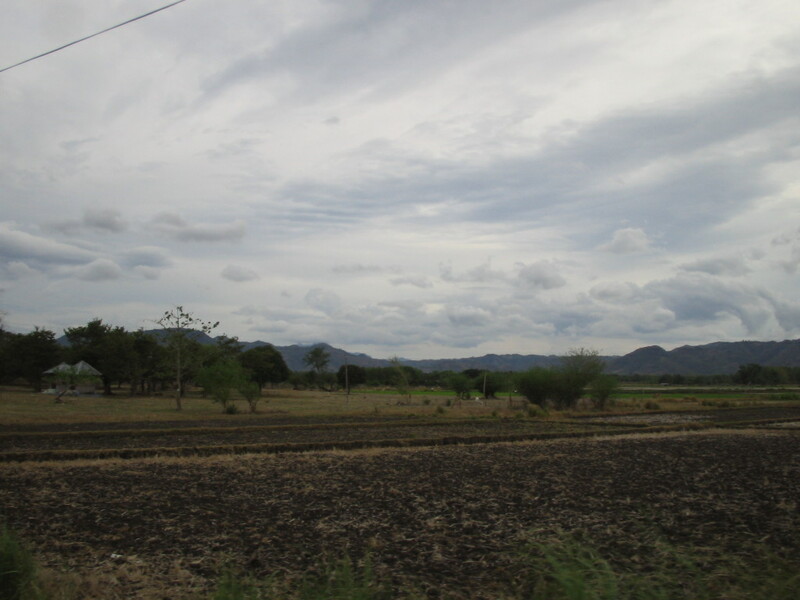 You will pass thru the towns of San Miguel and San Roque before you hit Rosario. From Rosario, drive on to Balugbug. 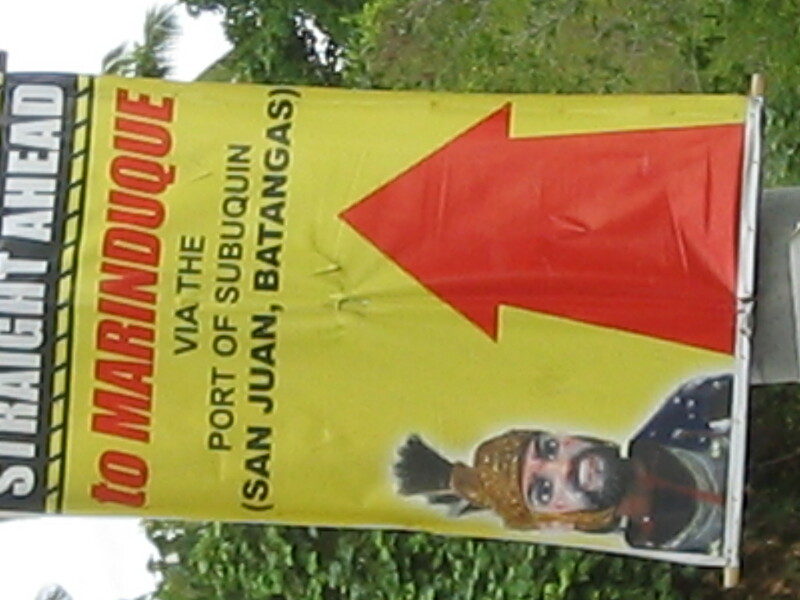 The next big town after Balugbug is San Juan. If you are going to Laiya, then follow the directions I gave in Route 1. Having taken the 2 routes, I will still recommend Route 1. It is easier to follow, and is not much longer. 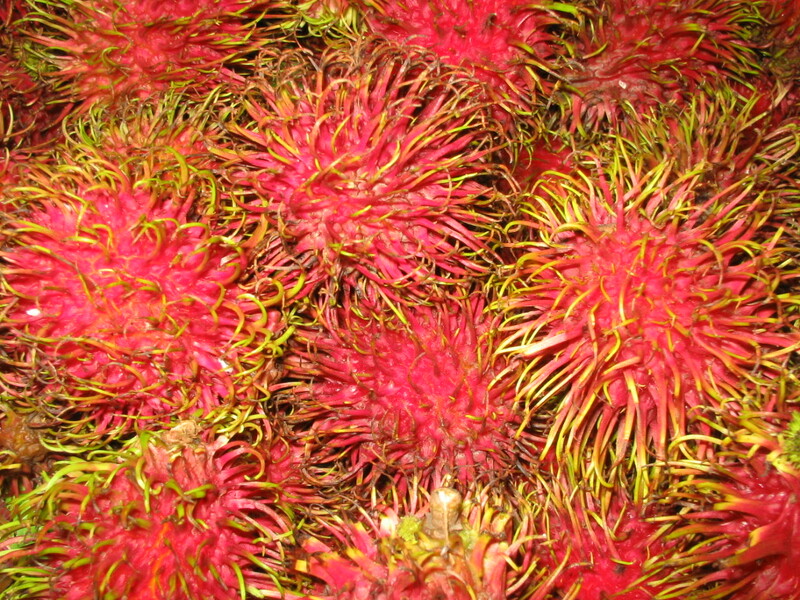 And then you can afford the adventure of taking the Lipa route on return. You may want to venture beyond Laiya. There is a pier in the area, past Acuatico and Balai sa Laiya cluster, that takes passengers to Marinduque, another exciting destination. I thought it was going to be an easy ride around Taal Lake. 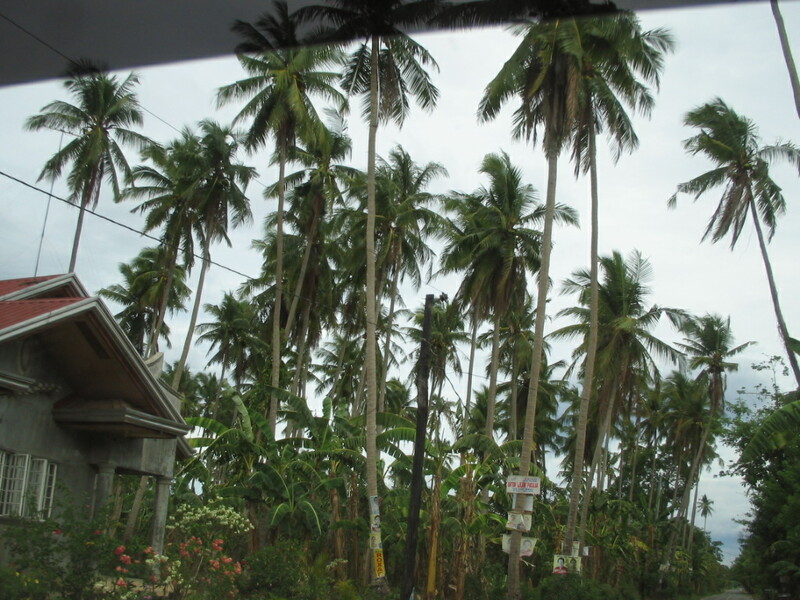 In our previous descents, we always took the Ligaya Drive route from Tagaytay to Talisay. The view is fantastic, and the road is good. This time, we took the zigzag road from the Tagaytay rotunda. A year ago, this was practically impassable. But it is now 100% finished, although some sections were only asphalted. At kilometer 59, I saw 2 bridges one after the other, both with strange names. 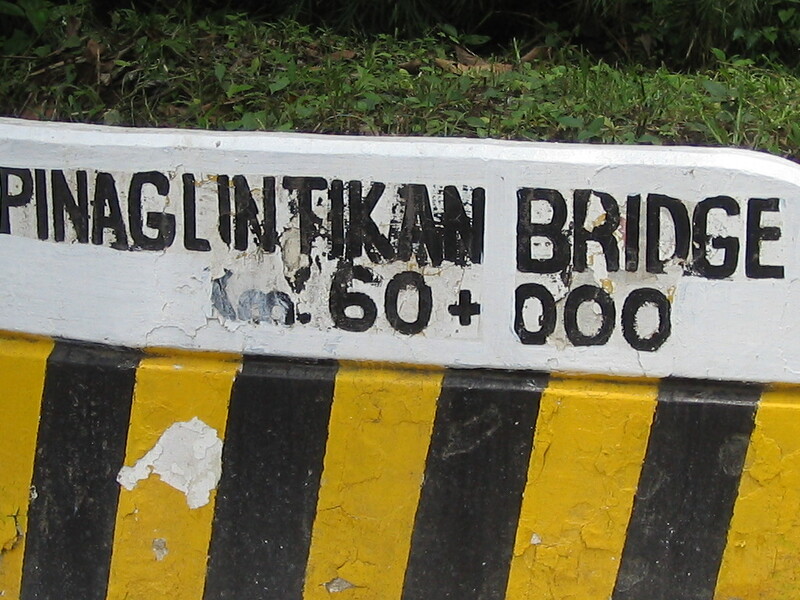 How does Alingayngay Bridge or Pinaglintikan Bridge sound to you? 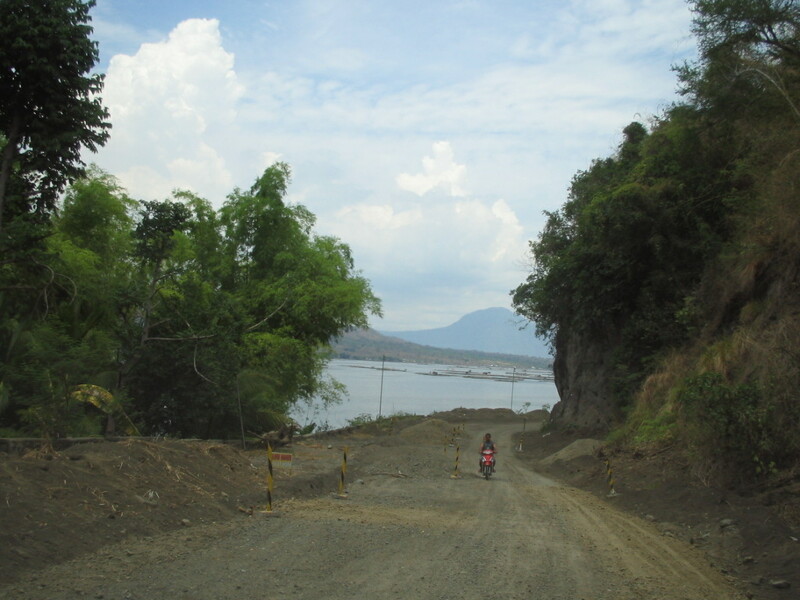 The zigzag road is about 12 kilometers from the top, ending in Barangay Leynes in Talisay. 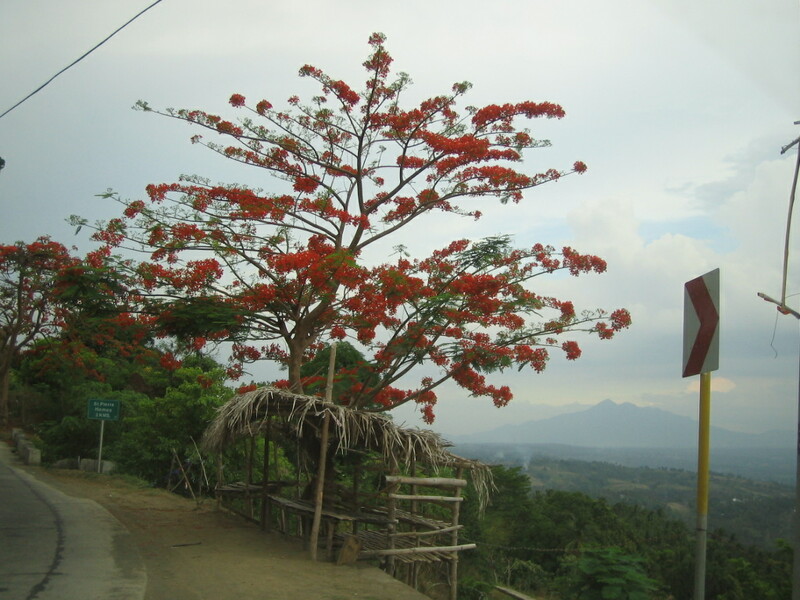 I have been to this part of Talisay before, countless times, each time having a drink at Gloria de Castro’s picnic place. 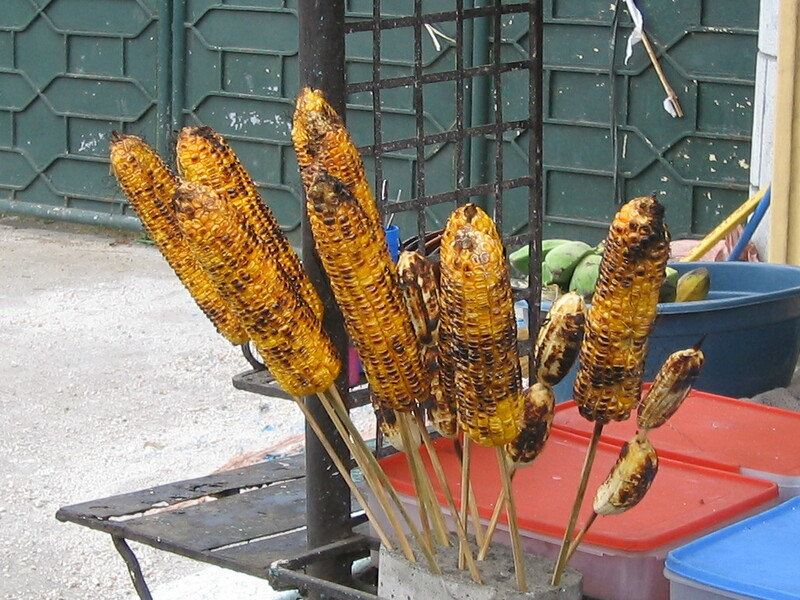 Or having fried tilapya, ginataang tilapya, or inihaw na tilapya for lunch. And a cold beer while marveling at the view of the volcano at dusk. Aling Gloria pioneered tourism here, accommodating foreigners in her home, earning her consistent mention in Lonely Planet and other travel books. On this trip, we skipped Aling Gloria’s place, and immediately turned right. This brought us to the town of Laurel. I remarked that this spot around the lake is probably the best. It is not as “developed” as Talisay which now has probably a hundred resorts dotting the lakeside. 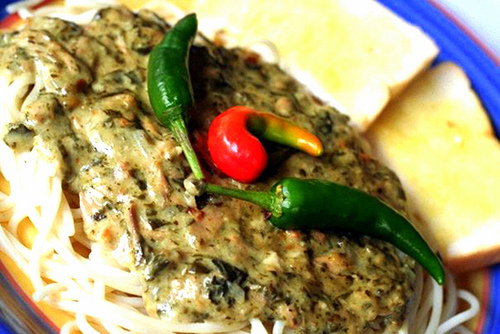 There is a spot from Laurel where you can drive up to Tagaytay, passing through the area where Splendido stands. We decided to stay within the lakeside. 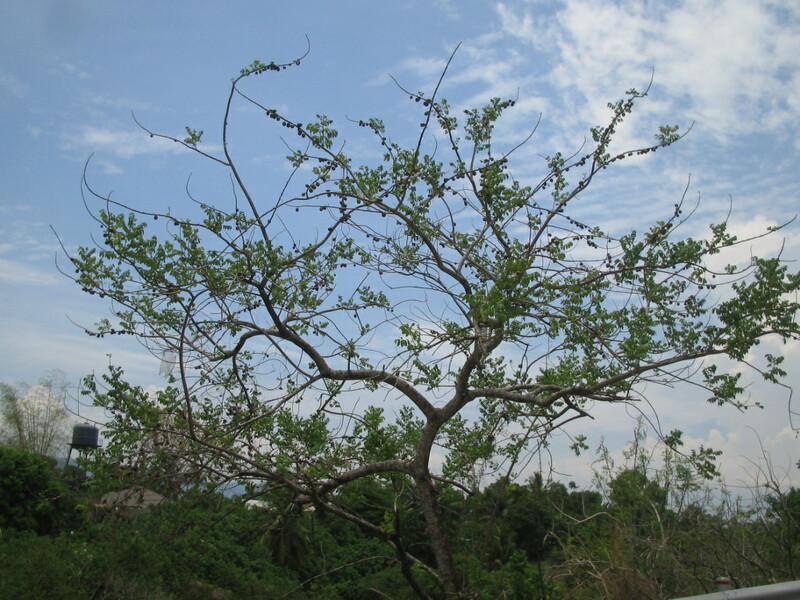 The next town is Agoncillo, and this brought back memories when my friends and I used to visit an officemate who had siniguelas trees in her backyard. But we went to Agoncillo then via Lemery, not from the lakeside. Thus,I never imagined how rough the travel can be. Or maybe because Typhoon Ondoy has just hit the country, and did not spare this lakeside town. 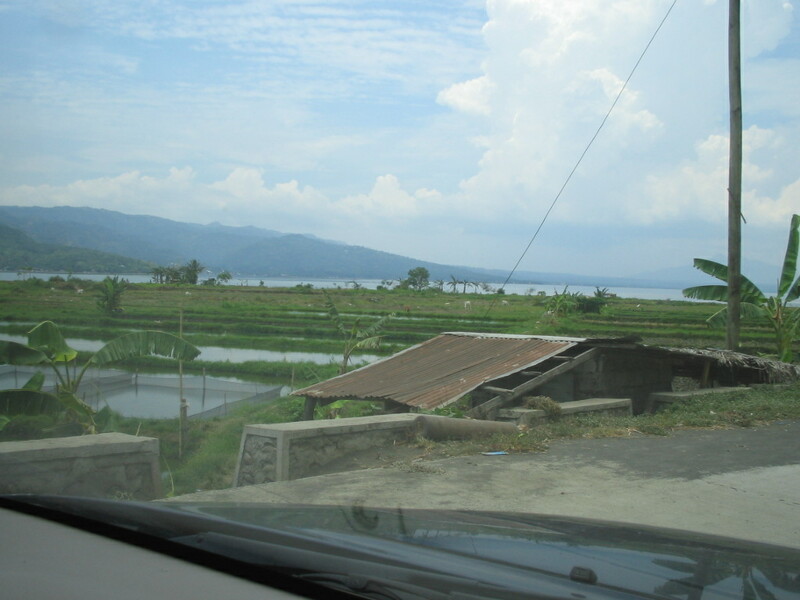 Within the lakeside, there were portions that seemed impassable, and the road literally merged with the lake. The maneuver is made worse when the road is on a bend, and you can hardly see where the road would go. And because the Toyota 4×4 Hi Lux is not an amphibian, I felt like we were, at any moment, going to be submerged in the lake. After successfully negotiating the lakeside, we found ourselves in roads that looked worse than feeder roads, or farm-to-market roads. Apparently, Ondoy caused all of these, washing away the asphalted roads, with several sections of higher ground eroded or washed out. 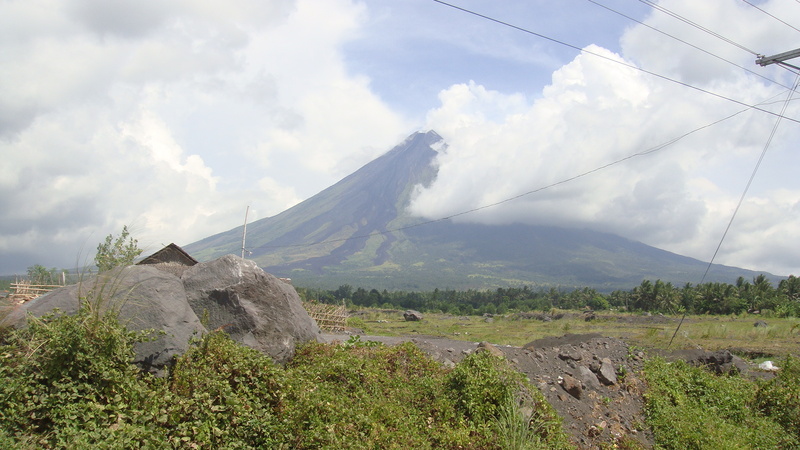 I swear the trip took on the nature of a 4×4 trek around Pinatubo. My 4x4 trail : no government here? The place is difficult to reach, to say the least. Thus, within Buso Buso, where, roads are for 4×4 trekking, there are no shops. Ambulant vendors try to make a living in the area. 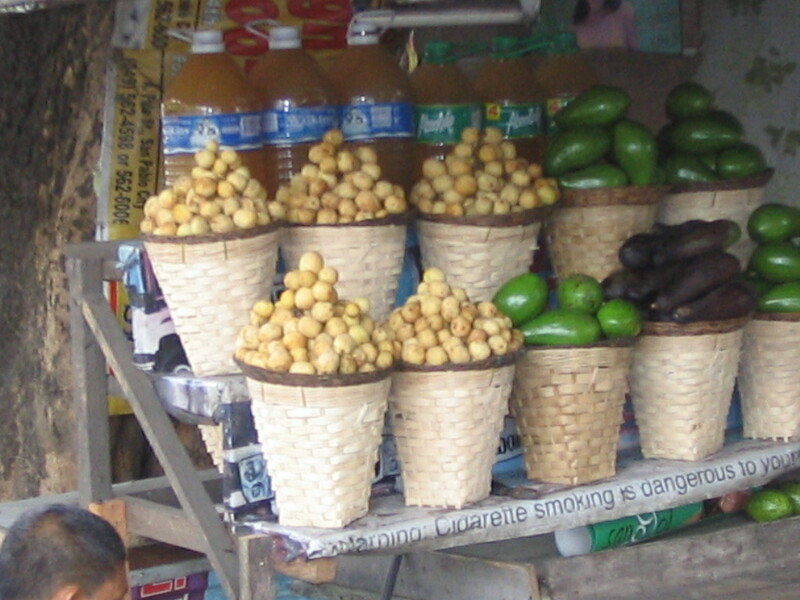 An entrepreneur thought that maybe a mobile grocery and sari sari store is just what is needed in this place. 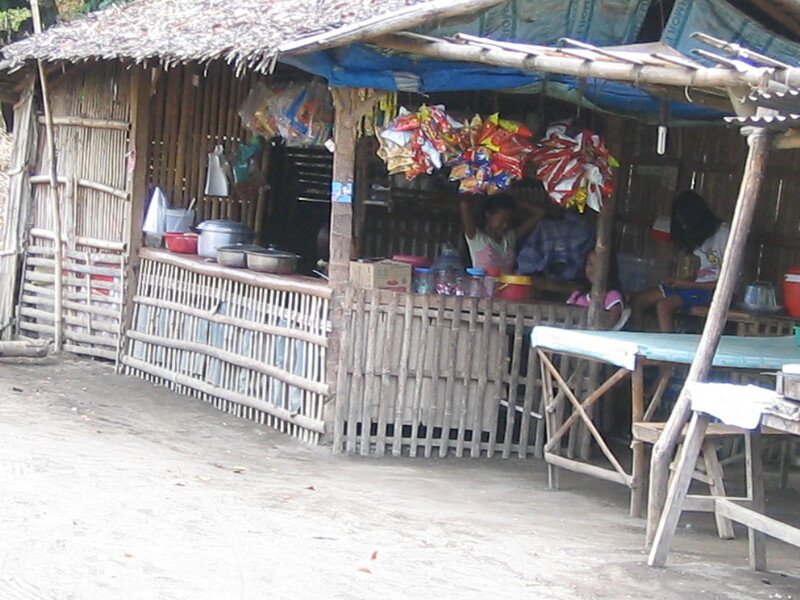 We stopped at past 12 noon in a “pondohan” where I saw kaldero at kaserola and tables and chairs. We ordered puso ng saging, one slice of pork chop, and one slice of afritada. Plus rice and 2 bottles of Coke. The bill went up to a princely P100.00 flat. Moving on, it felt like driving in an uninhabited area where we only followed trails.Next we came to an area where roads got a bit better. Until we finally saw civilization. Within Agoncillo proper, I saw some really beautiful homes. Big homes. Contrast this to the next barrio, just where we came from, which seemed like no man’s land. We left Agoncillo for Lemery, and drove back to Tagaytay. Still, I couldn’t believe that a 4×4 adventure trail existed almost within my Tagaytay backyard. With nothing to do, I thought I’d check out my neighborhood 4×4 trail. I found the water level in the lake has gone down, There is no more bend where “the lake meets the road”. Workers are doing the pavement, and, hopefully, the roads will be passable even after a typhoon. But when I say passable, I mean just that – – – passable. 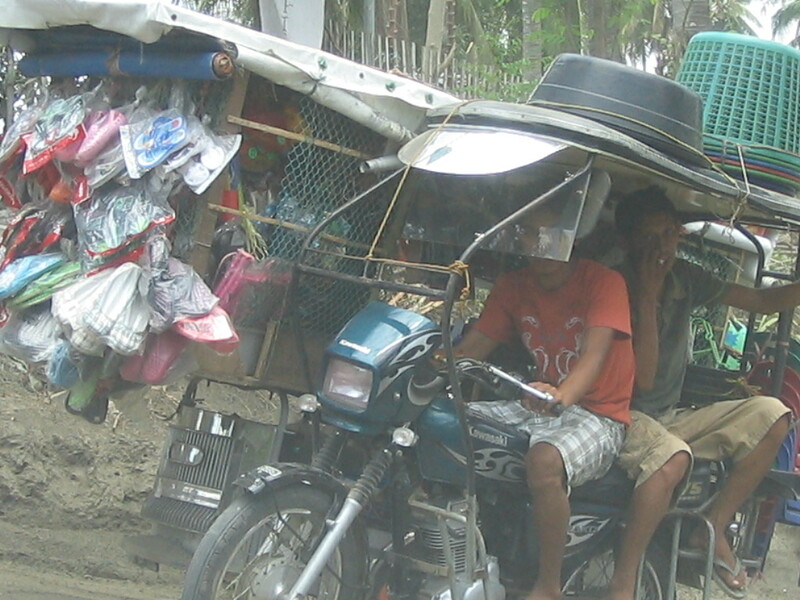 I couldn’t believe it that way after Ondoy, and even after the elections, the roads have not improved a bit. Now, I have concluded this may not have been caused by Ondoy. The flooded lake, yes. But not the status of the road itself. The roads are so bad you would wonder if this area is within the jurisdiction of any local government. It is as if the governor does not know that such road existed in this first class province. It feels like there is no mayor, no congressman. Or maybe they are not part of the Philippines. On a positive note, I will always have a place for 4×4 experience. This time, too, I went on to Lemery town. 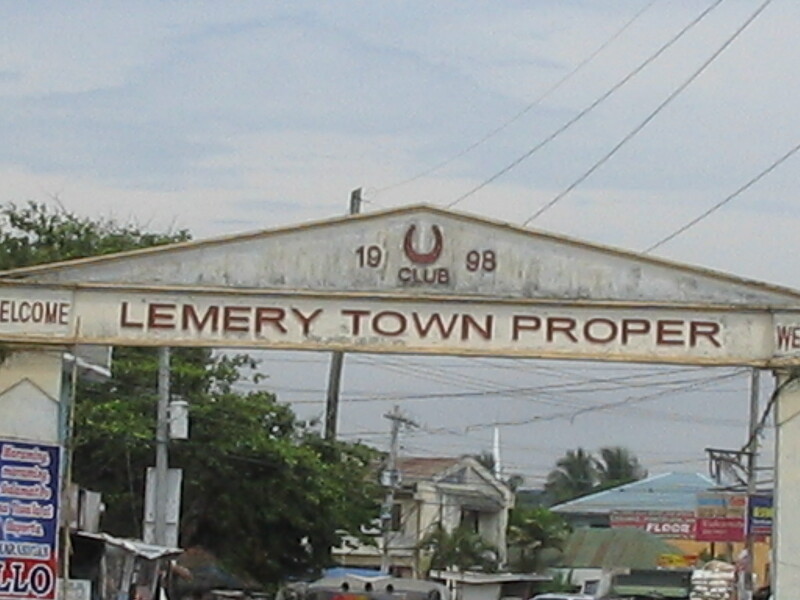 Lemery is 45 kilometers from the Tagytay rotunda starting point., to complete the trip around the lake. From Lemery, I drove to Lipa via Batangas, took the STAR tollway and made my exit in Tanauan, heading back to Tagaytay via Talisay. 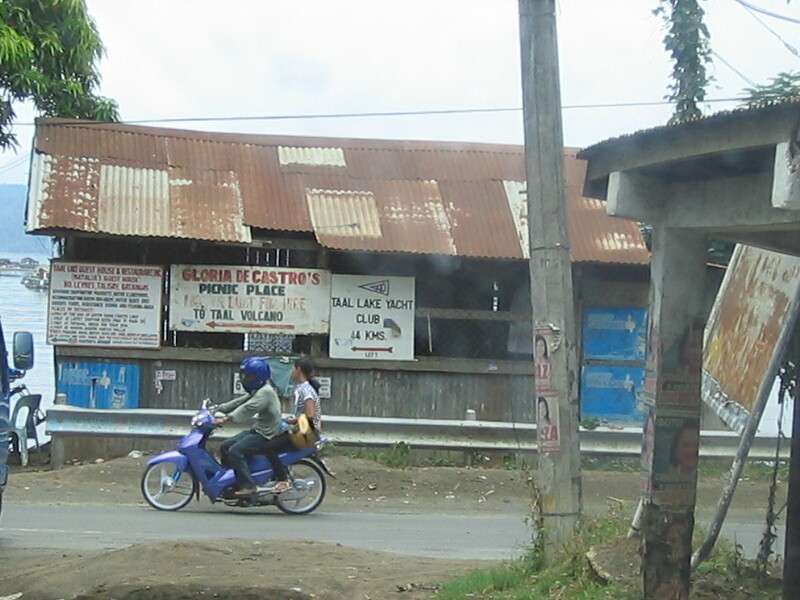 From the Tanauan exit, the first barangay is Santor, and then Talaga. 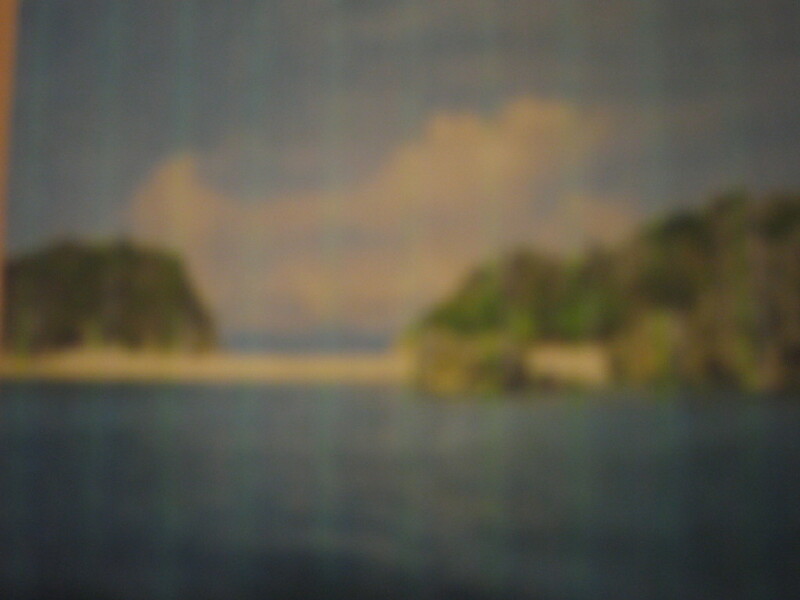 A good place to visit is the Mabini Shrine, the birthplace of the Sublime Paralytic. 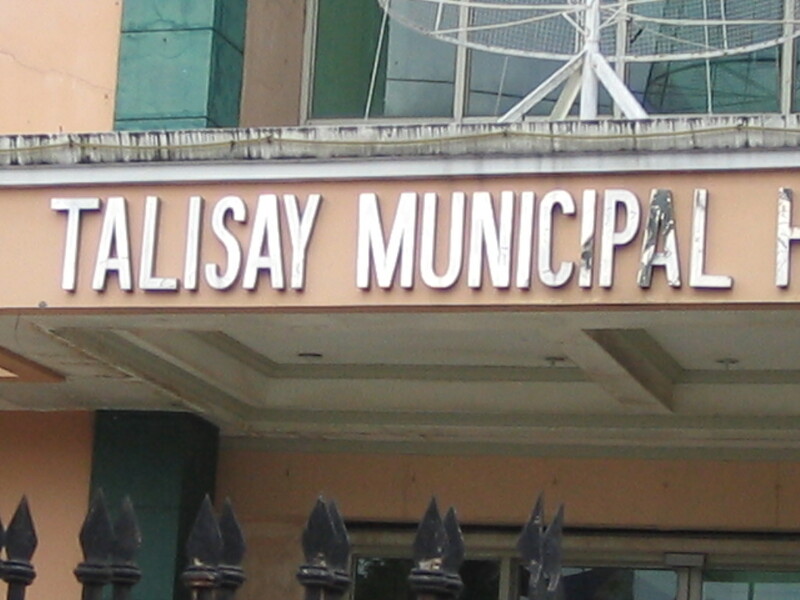 A few kilometers away and you will get to the town of Talisay. 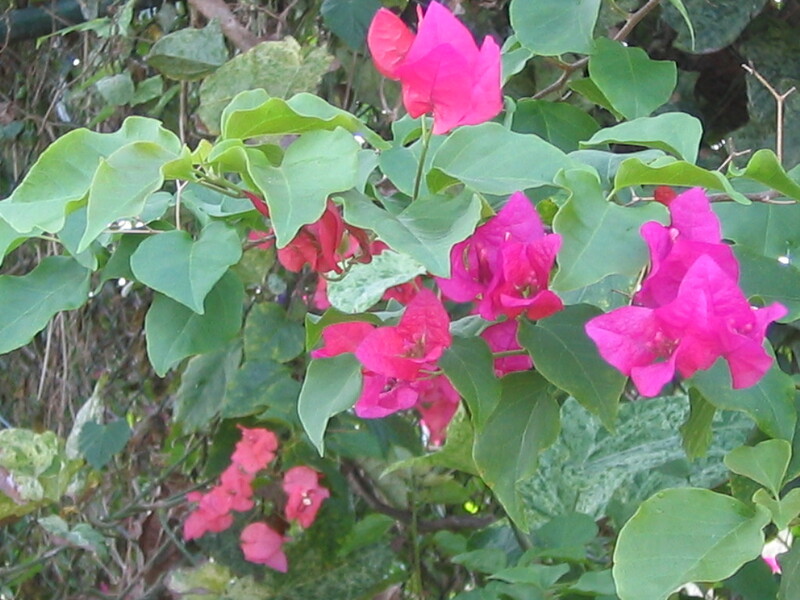 Talisay is a destination in itself among garden enthusiasts. 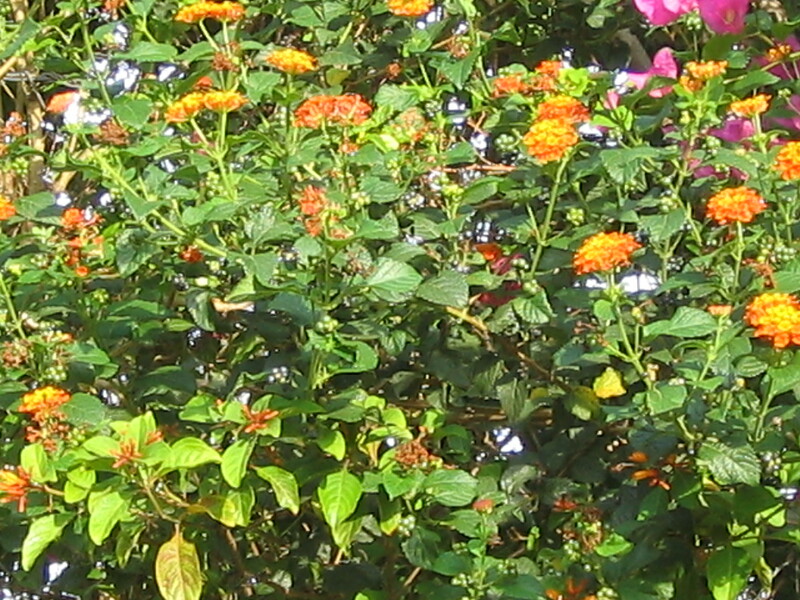 There are hundreds of backyard gardens selling plants – – from trees, to shrubs, from fruit trees to ornamentals. 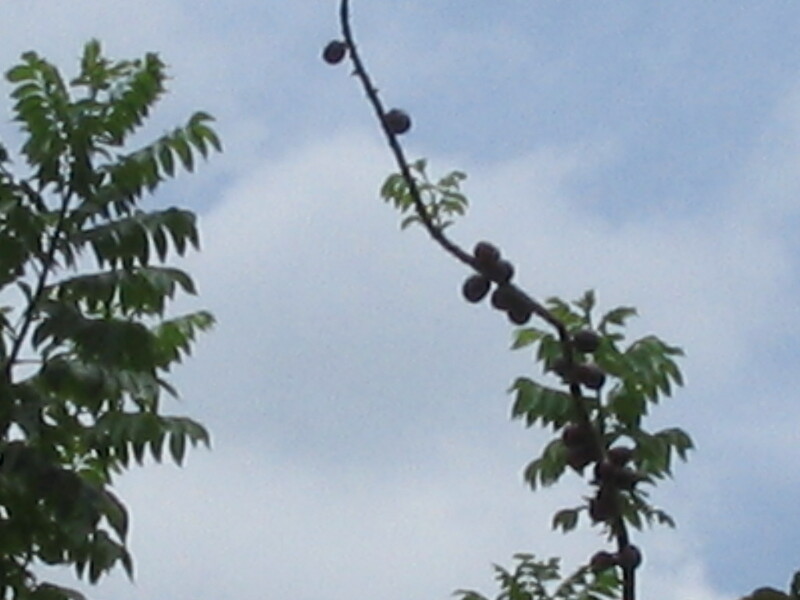 I bought a mango tree from Talisay, and right now the tree has at least 50 mango fruits waiting to ripen. 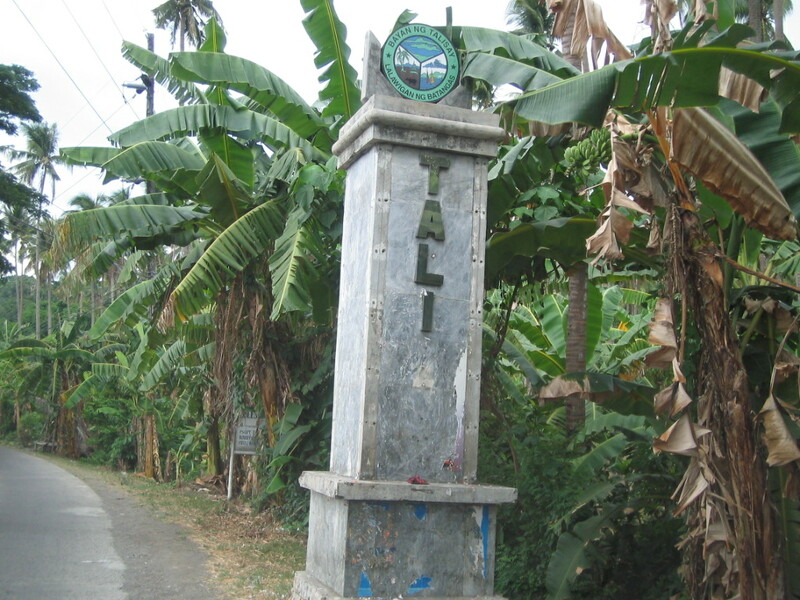 Talisay marker, cut out letters to promote Tali Beach? 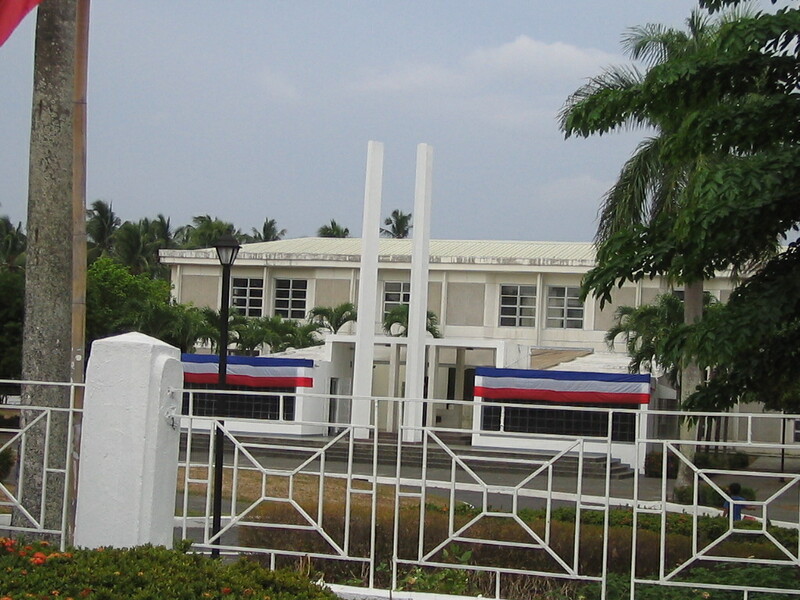 I took a quick snapshot of the Talisay Municipal Hall and headed back to Tagay tay, this time thru Ligaya Drive. 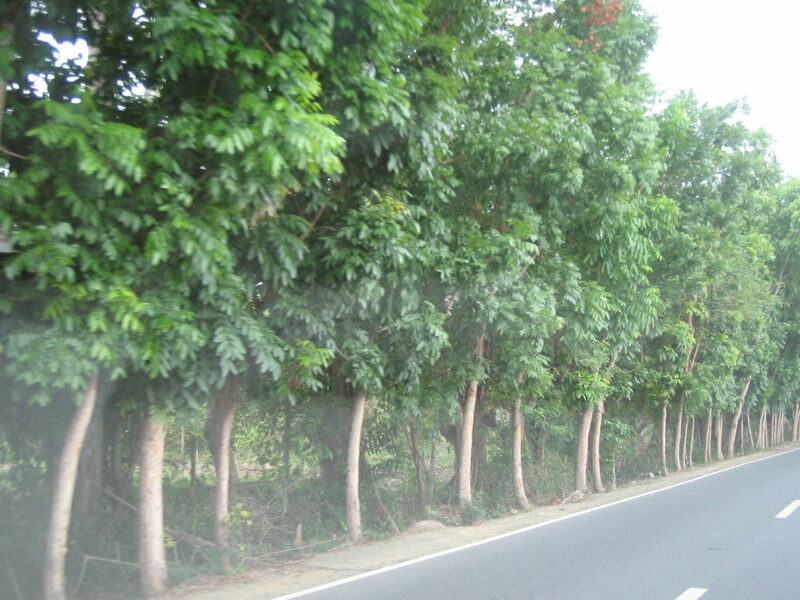 Along Ligaya Drive, one can see locals on horseback, fire trees on the road, and three areas being developed by Filinvest as mid-to-high-end residential subdivisions. The 3 areas are collectively called Leuna de Taal. The area nearest the lake is called Orilla, with easy access to the exclusive clubhouse on the lake. 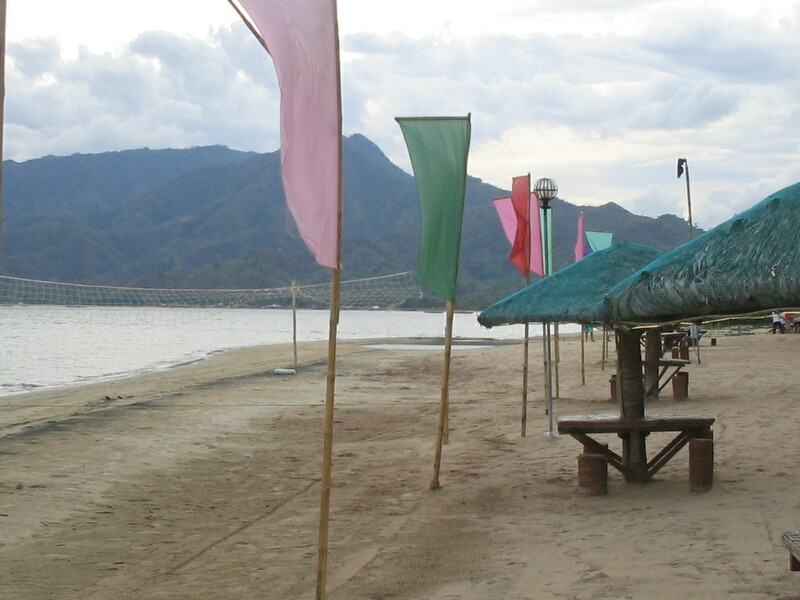 The Bahia is at the midpoint of Ligaya Drive, and has views of the lake. 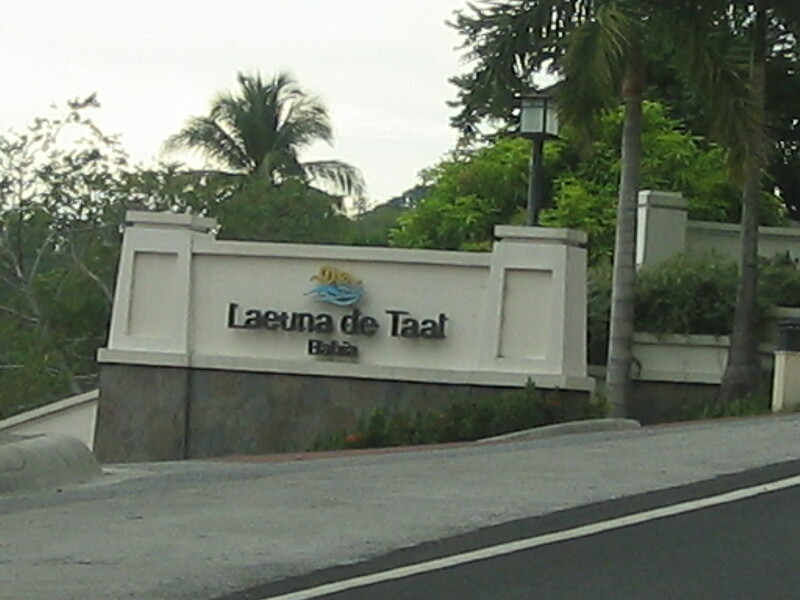 The highest point among the Leuna de Taal properties is now being developed as a townhouse community. 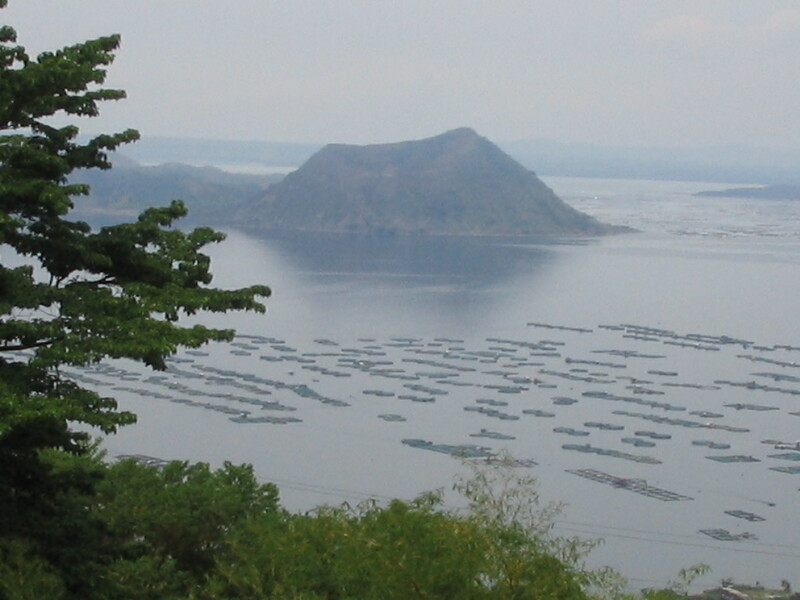 Units are sold for P3.6 million, with the splendid view of Taal Volcano and the lake as bonus. This is my daughter’s favorite. Within the park, visitors can watch a seal show, a dolphin show, a whale show, and actually swim with the whales. And ride the whales. 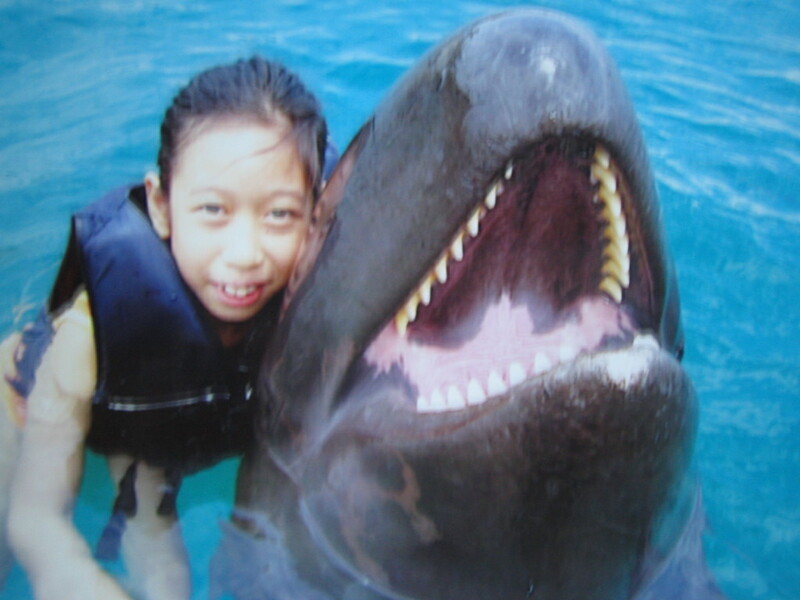 The handlers took my daughter from the shore to the raft in what I thought was not possible. 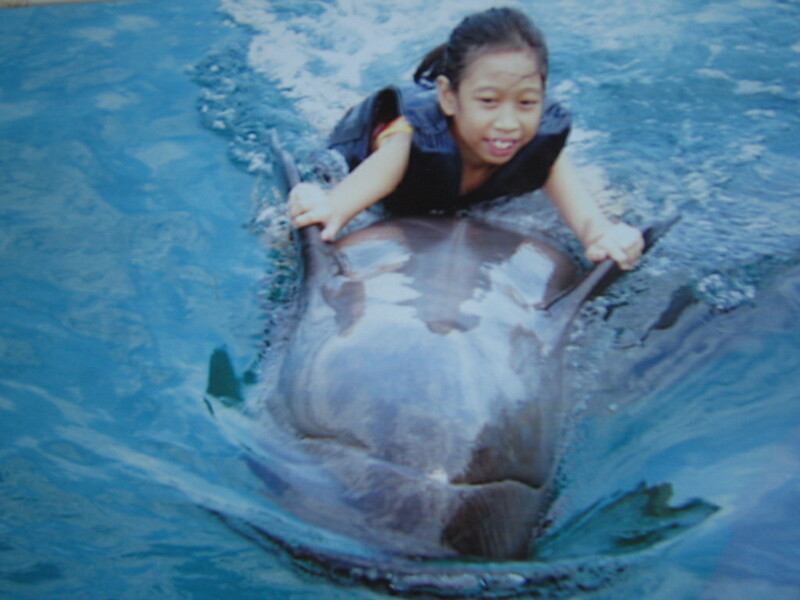 The whales were beached on the shore, and my daughter was asked to ride it and hold on to the fins. With a whistle, the whales swam to the raft, bringing my daughter there. 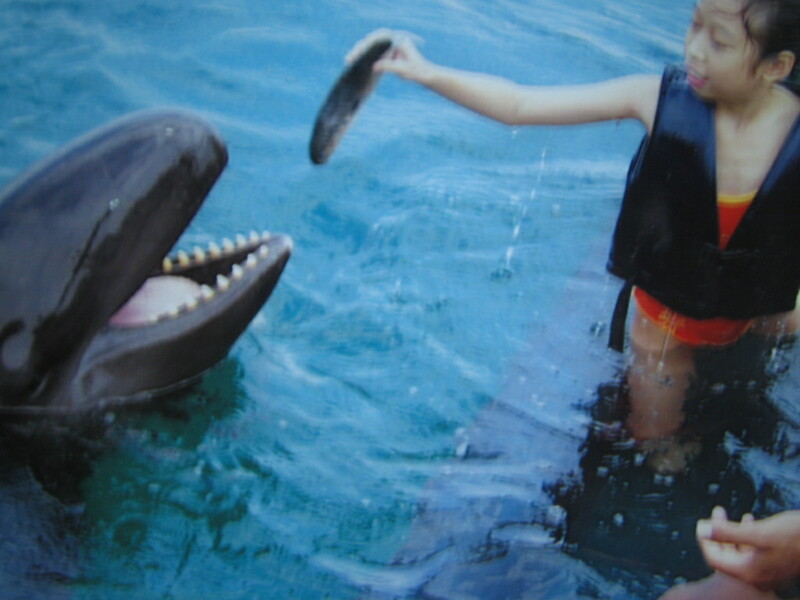 At the raft, the handlers taught my daughter to feed the whales, after which she actually rode the whales, sometimes belly up. Entrance fee to the park is P500 per adult, P420 per kid. The Swim Encounter is at P4,200 per person. The Beach Encounter, an encounter with the whale just on the beach, essentially for photo-ops, is P2,800. I wouldn’t recommend the latter. 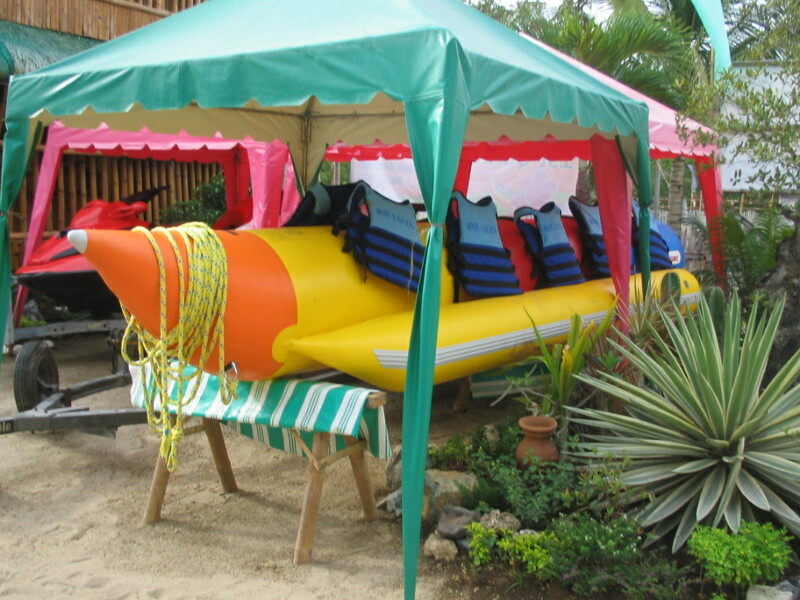 Ocean Adventure can be booked thru their Manila office at phone (+632) 2944891. 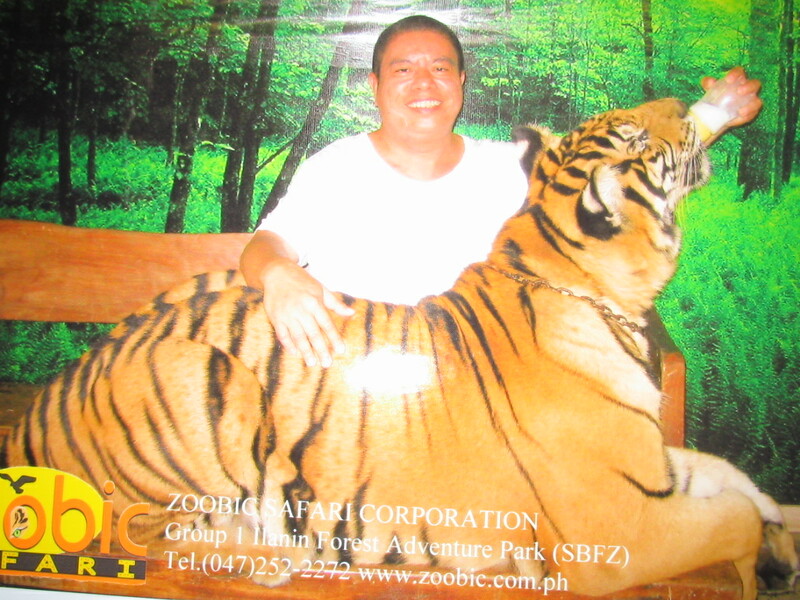 Entrance fee to the Zoobic Safari complex is P495. The tour starts with a briefing from one of the many guides. The girl assigned to us did not seem enthusiastic about the job, and was just going through the motion. As we moved to the zoo with caged animals, she would give some trivia about the animals, almost always ending with the estimated life span of the animals. For instance, tigers can live 15 to 20 years in the wild, but live 5 years longer when in captivity. The fun part in this leg is when kids are allowed to feed the goats from feeding bottles. I saw a service van with the name Residence Inn at the back. 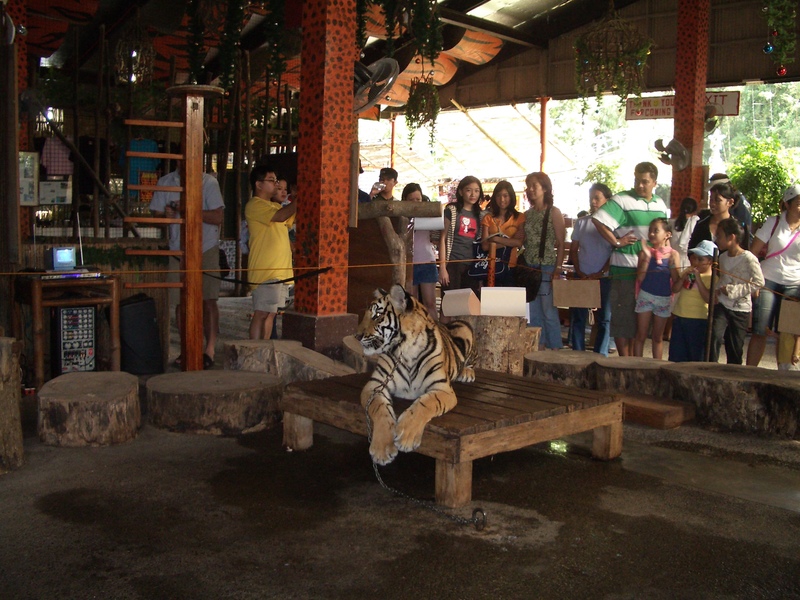 Apparently, without having verified it, the place is run by the same people who run other zoos like the one in Tagaytay, now named Paradizoo. Going back to the zoo visit. We were then all ushered to the trains that will take us thru the savannah, at P5 per head. Although there is an option to bring your private car and just convoy with the train. I rode .the train. First stop was the Tiger Safari. We were transferred to a big jeep with sturdy protection. 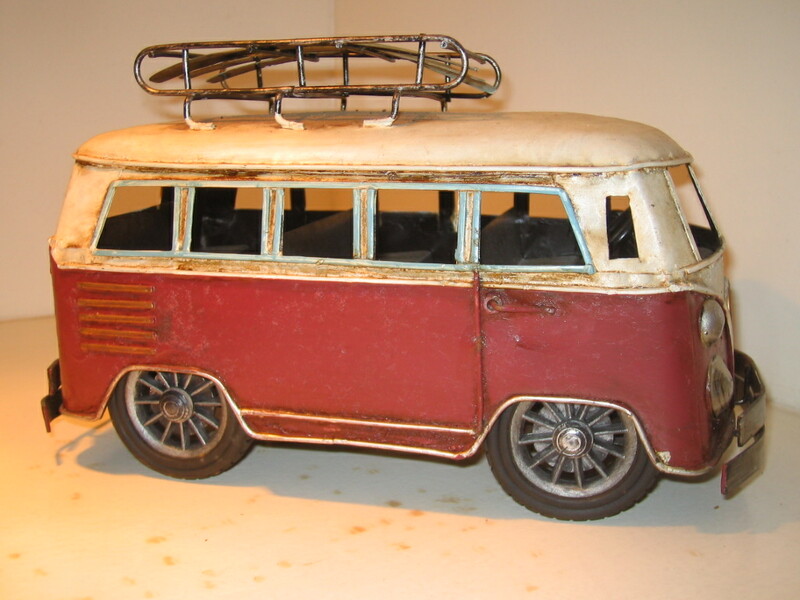 Imagine the school buses with the wire mesh on the windows. Except that there are also grills on top of the wire mesh. We were given suggestions to buy slices of fresh chicken to feed the tigers roaming in the wild. Huh!. Until we were told that professional handlers were joining us in the jeep to feed the tigers. The gates opened. Actually a series of 2 gates, to make sure the tigers don’t escape. And then we were inside what looked like a somewhat barren wooded area with tigers roaming, just outside of our jeep! 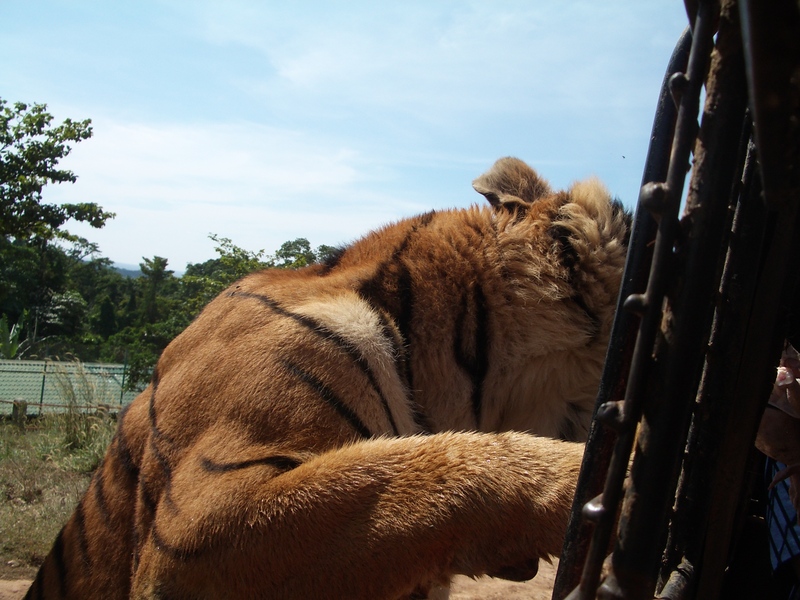 The handler took a piece of chicken and moved it to a small opening and, pronto, 2 tigers came to feed. Cameras clicked, only the wire mesh and the grills separated us from the ferocious animals munching on the chicken from the small opening. A little boy cried, so afraid! 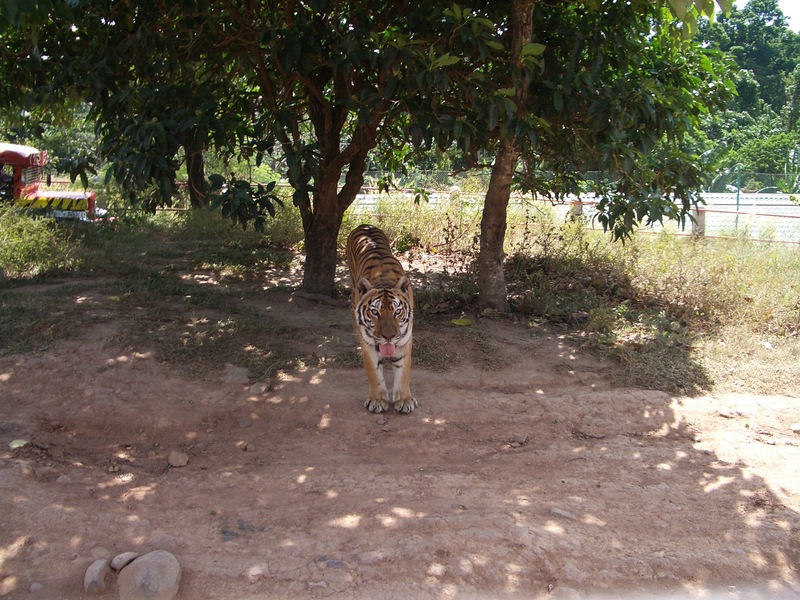 We were face to face with the tigers, eyeball to eyeball, an inch away! 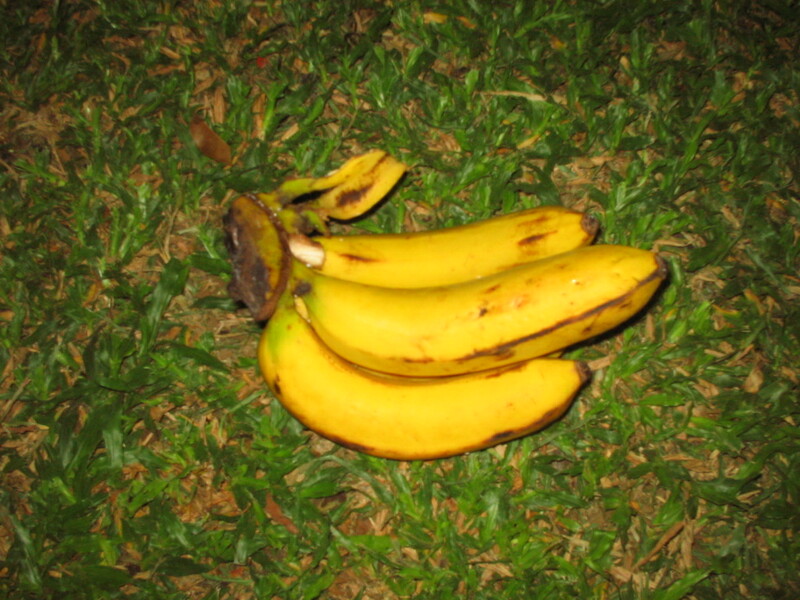 A third tiger joined the contest for food. When 3 pieces of meat have been done by the 3 tigers, we moved on. The handler then put out another piece of meat and a tiger saw it. As the tiger approached the jeep, the handler threw the chicken meat to the roof, and the tiger jumped to the roof. Our roof was made of glass, with grills for protection. So a tiger was above our jeep, munching on the chicken, for a good 5 minutes as we went on. We then made an exit, again through 2 gates. And then we were back on the train. 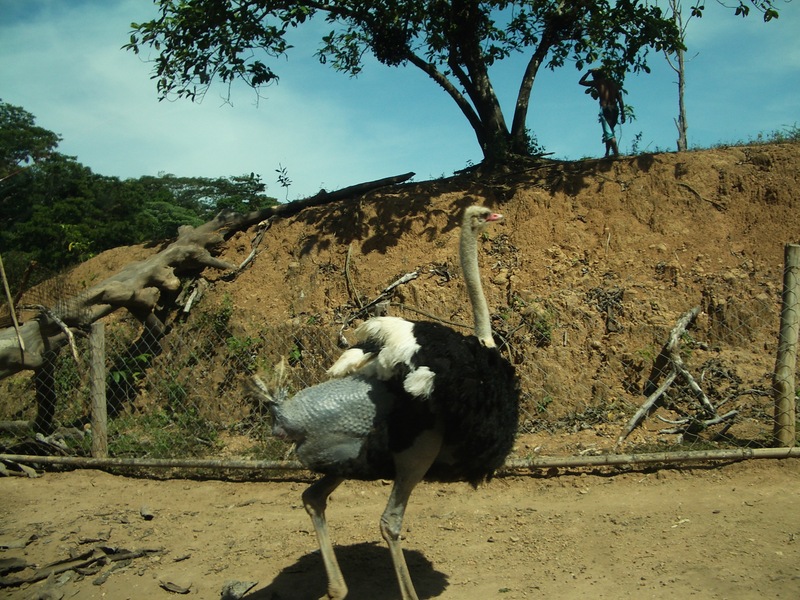 The train moved to the savannah where ostriches roam. Saw their eggs, each one the equivalent of 2 dozen chicken eggs. And then to the tiger den, an enclosure at the perimeter of the tiger safari. 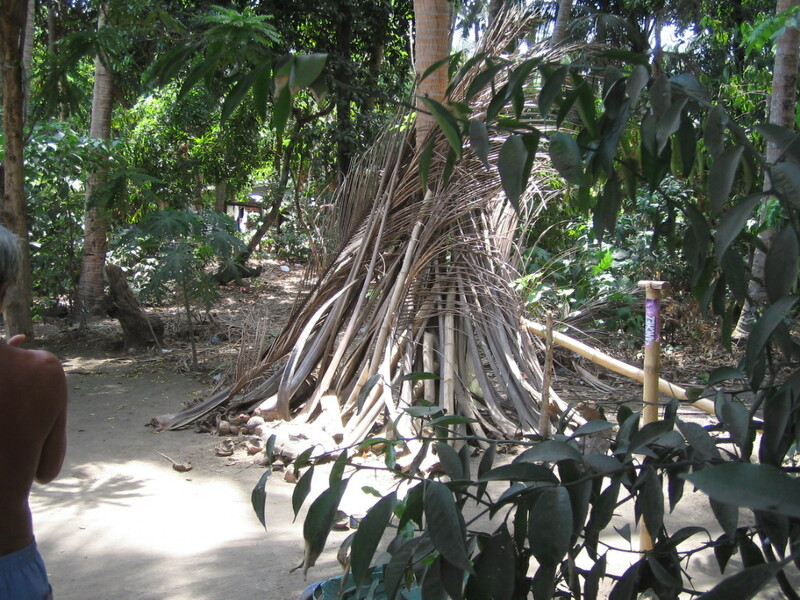 From the tiger den, we moved to an Aeta Village where natives danced and showed agility climbing trees. 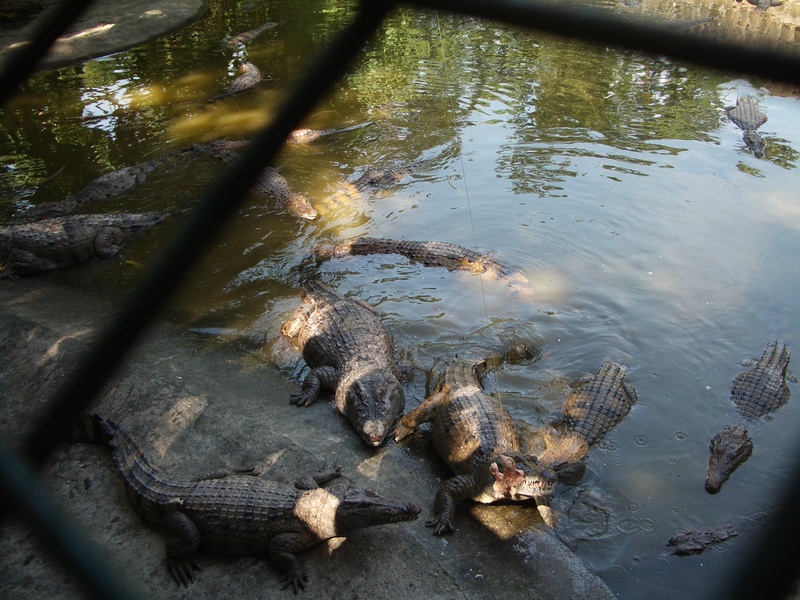 The tour moves from there to the crocodile section where guests can feed crocs with meat suspended from poles that looked like improvised fishing rods. I have never experienced anything like it. It was well worth the time and the money. Although I could skip the other parts next time, and just experience the tiger-feeding safari again. 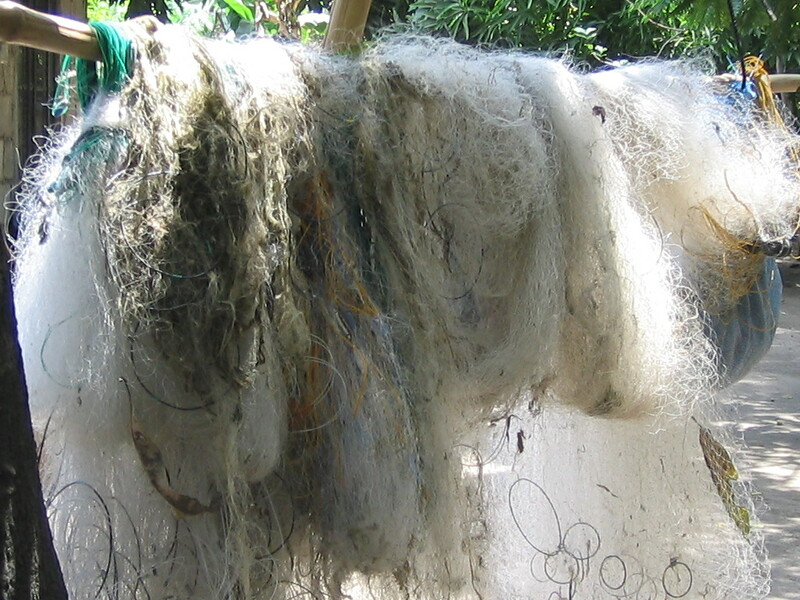 The photo below was taken on one of my visits. 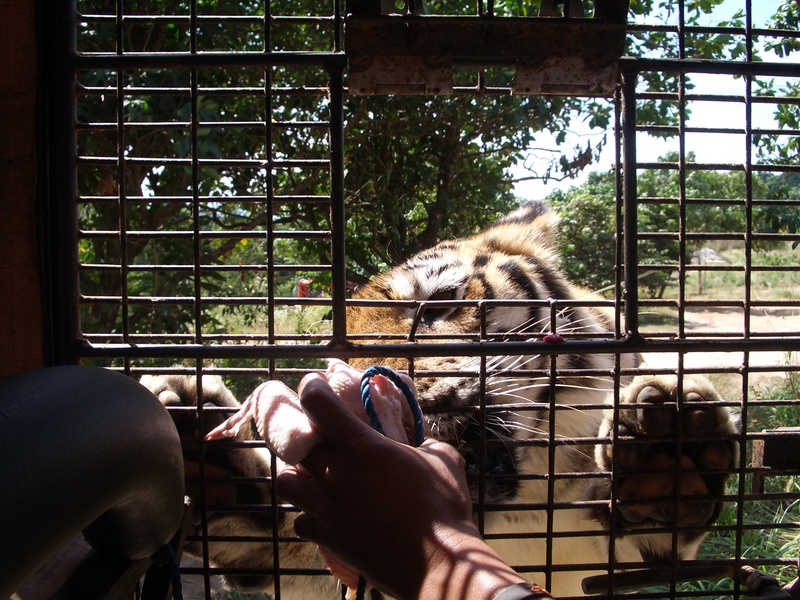 I regretted leaving the camera in the car, so I had to make do with a photo to be taken by the Zoobic staff as I went inside a cage to pet and bottle-feed a full grown Bengal tiger. This was right inside the orientation area, just after the entrance gates. For P240, they will take a photo of you using their camera, and another using your camera. For this post I had to take a digital file of the hard copy I got for my P240. If you should do this, make sure your camera is with you. 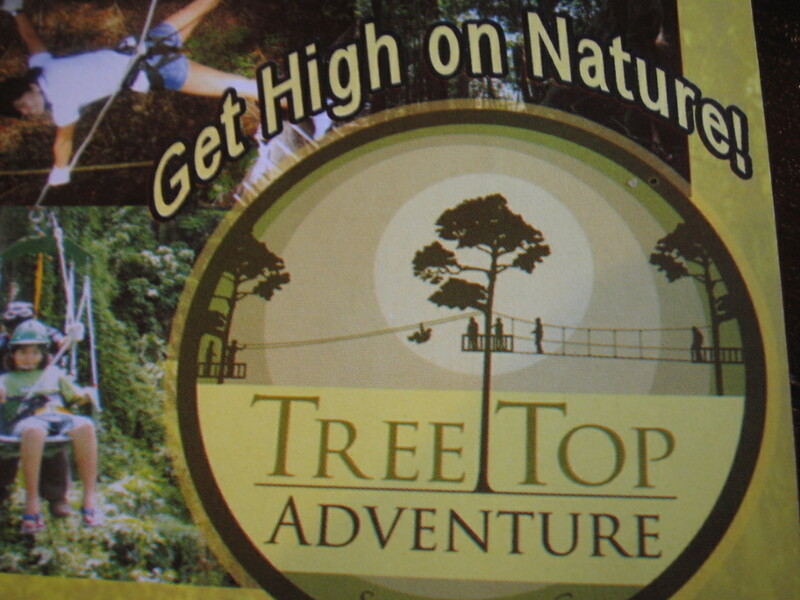 There is Tree Top Adventure Subic where you can “get high on nature”.Cross suspension bridges, take zip line rides. cable rides, or just trek. 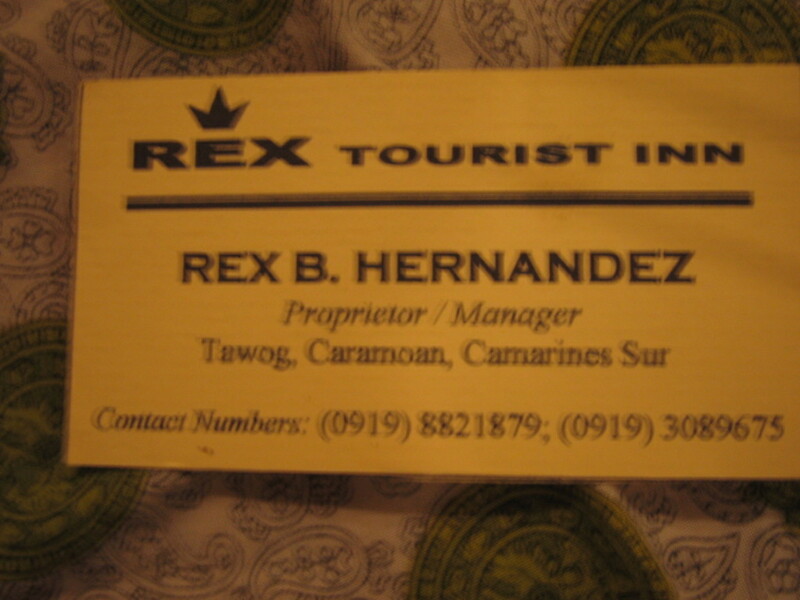 Cable ride is P350 per pax, Zip line is P200, Guided trek is P100, and a tree-drop is P150. 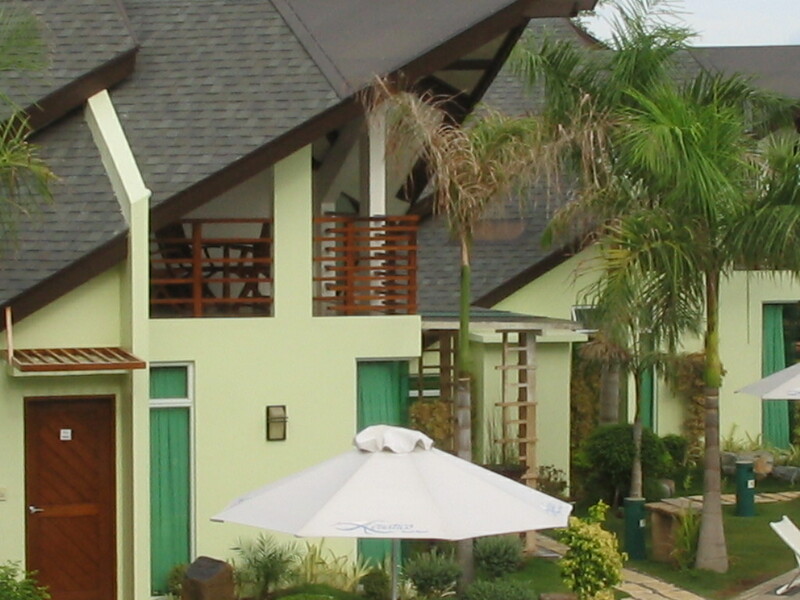 Where to Stay My favorite hotel in Subic, inside SBMA, is Segara Villas. Lighthouse comes as a close second choice. On a budget, I once stayed at Pista sa Barrio, a restaurant which recently opened an inn within the same complex. Segara Villas has only 10 Balinese-inspired villas, with some of them classified as executive accommodations, with the bed on a loft. 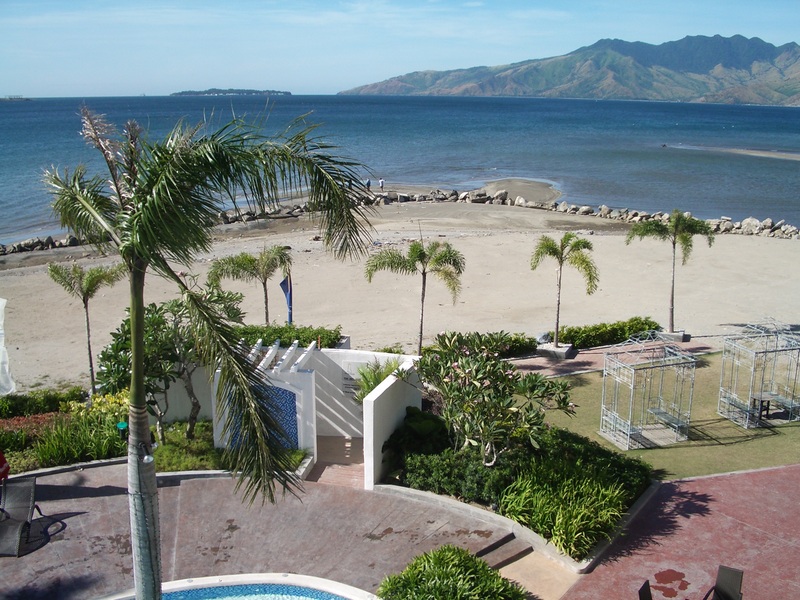 Lighthouse is actually listed as one of the Top 10 attractions of Subic, in the SBMA video shown to visitors. Indeed, it is pretty. But the rooms are only for those who are very intimate with each other, as the toilet and bath is separated from the bed only by a smoked glass. The furnishings are A-1, and definitely 5-star. The restaurant downstairs has a full course for breakfast, easily the best breakfast buffet in Subic. 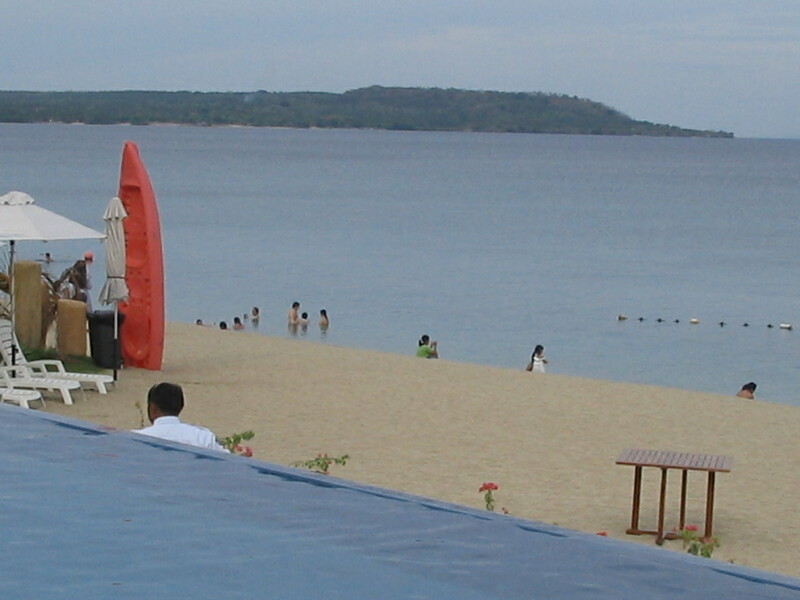 A swimming pool is at the back, facing the sea. 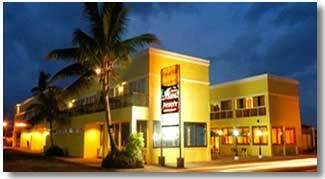 Outside of SBMA, the 2 hotels I recommend are White Rock and By the Sea. 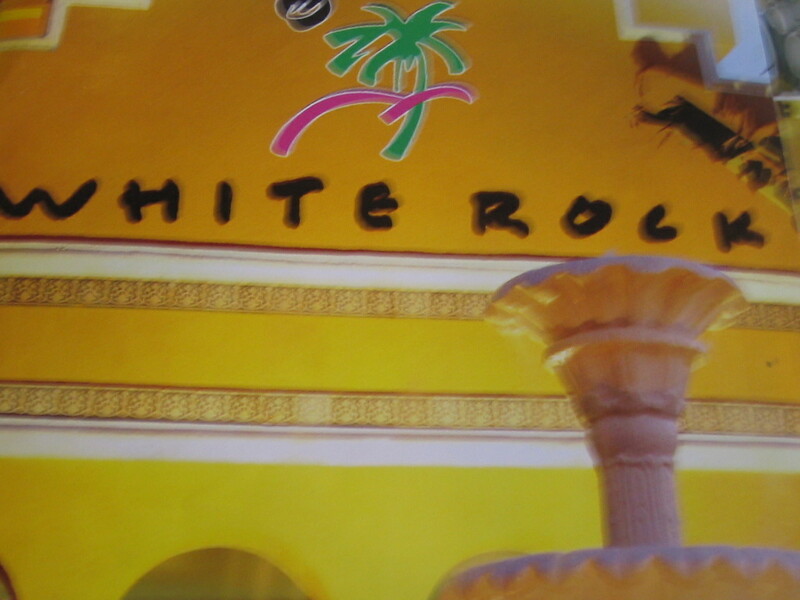 White Rock has long been popular.